We are a jk-6 school. 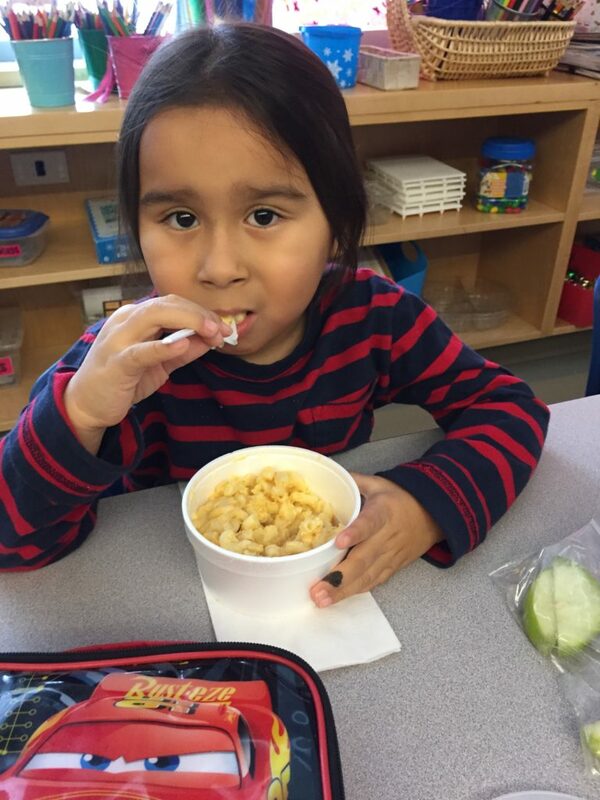 We provide a healthy snack to our students twice a week and encourage healthy lunches. Our students love to be challenged so this contest will be fun!! It’s important to add fruit and vegetables to every meal. We chose to serve carrot sticks and tzatziki dip to the first pizza day of 2018. Giving our Cubs a healthy start to 2018. 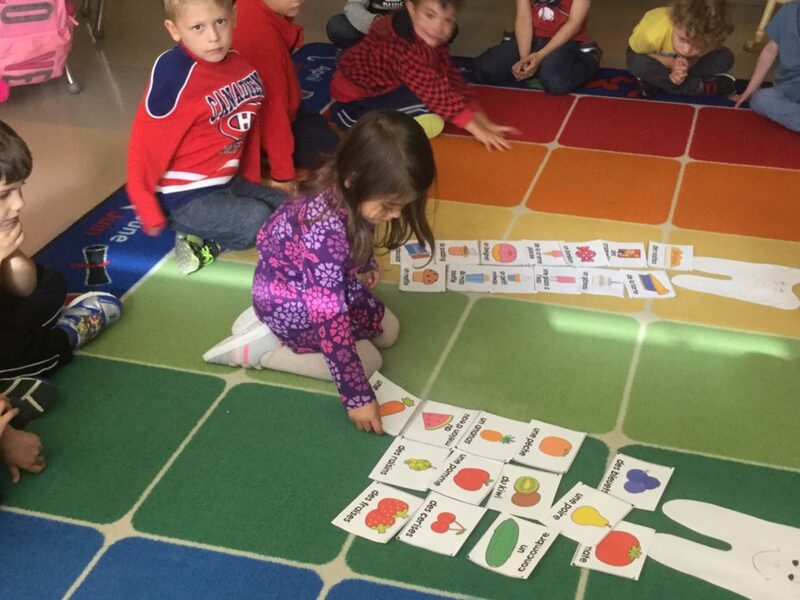 This FDK class learned the difference between sugary and healthy foods. Using pictures made it easier for the students to see the food and identify what kind of food and determine if it was a healthy choice. Holy Cross staff sat down for a healthy meal before our Christmas concert. 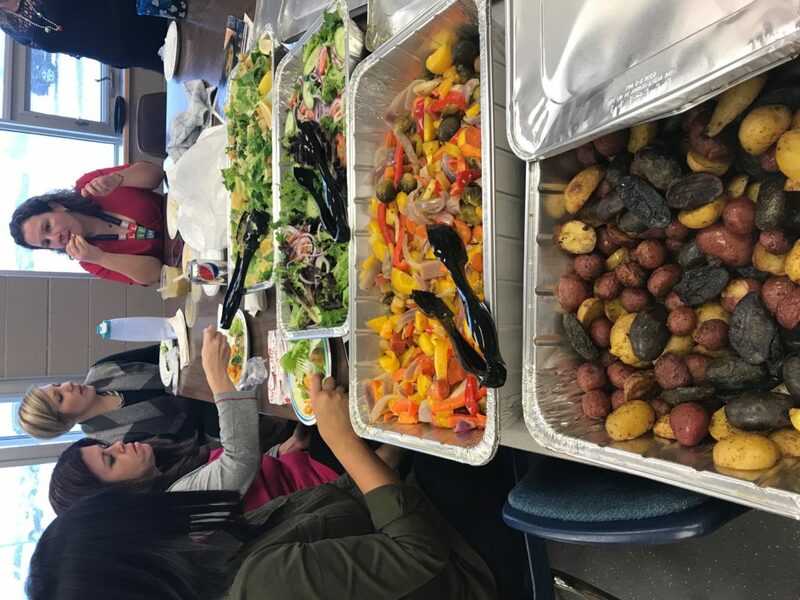 The staff were leading by example by choosing healthy food like salad and grilled vegetables.We all need to remember even with busy schedules to stop and make time for healthy foods. 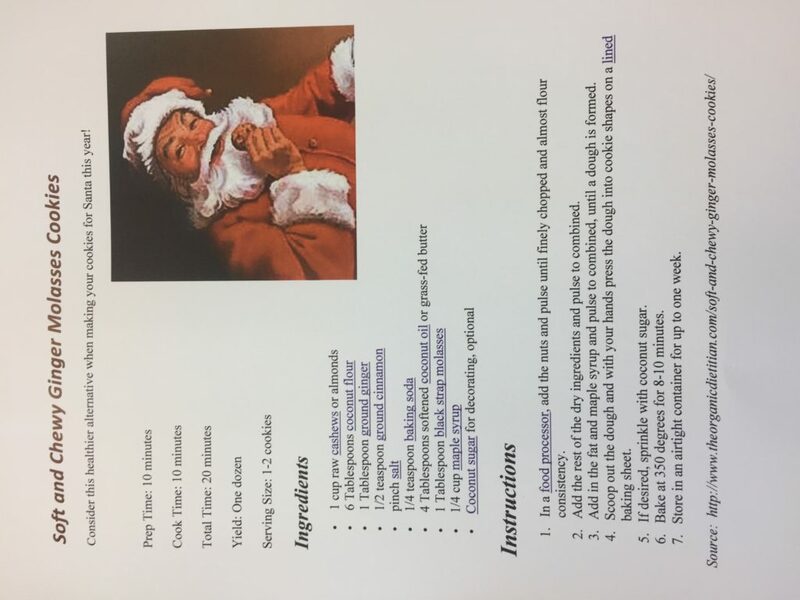 With the help of our Facebook page we shared a healthier cookie recipe to try at home. It looks like a great recipe to make with our cooking club too. Thank you to Ms Stirret for giving us a healthier cookie alternative. 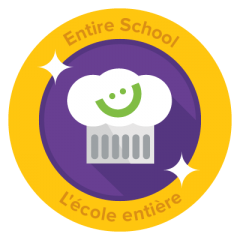 Even the youngest students can learn about cooking. This class started their cooking class by learning how to prepare before we cook,safety of using something that can be sharp and always having an adult supervise them. They made apple slices. This may seem simple but it is something they can do at home . We found a few cubs refilling at the water station. 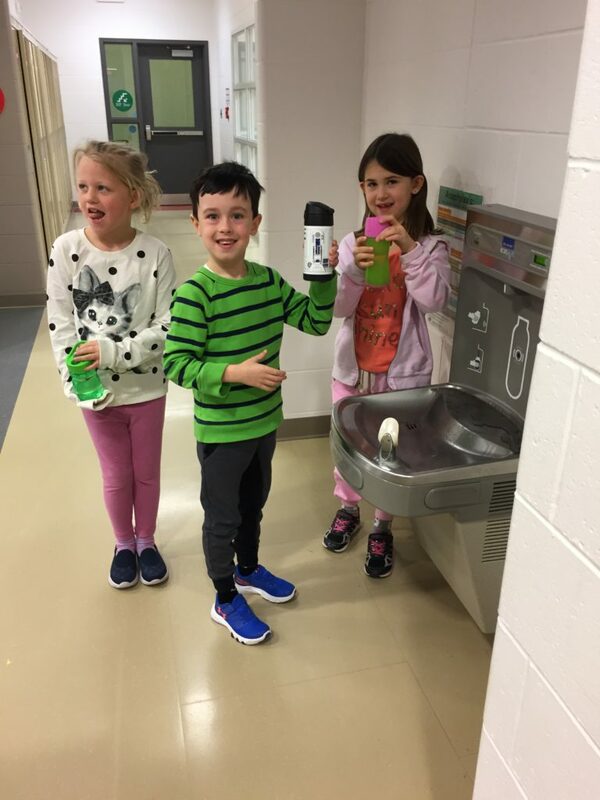 Ms. Visentin reminds her class every morning and afternoon to refill their water bottles. Keeping hydrated helps to keep is focused in class. We found a recipe for hummus on the Eat right Ontario website that was made with Romano beans instead just the traditional chick peas recipe. Ms. Riutta’s class took part in the cooking lesson. We discussed food and cooking safety when using a blender. We decided to try out a few recipes from our Adventures in Cooking club. We will begin this program in January but we thought we would practice a few and get the students opinion of what they thought of it. 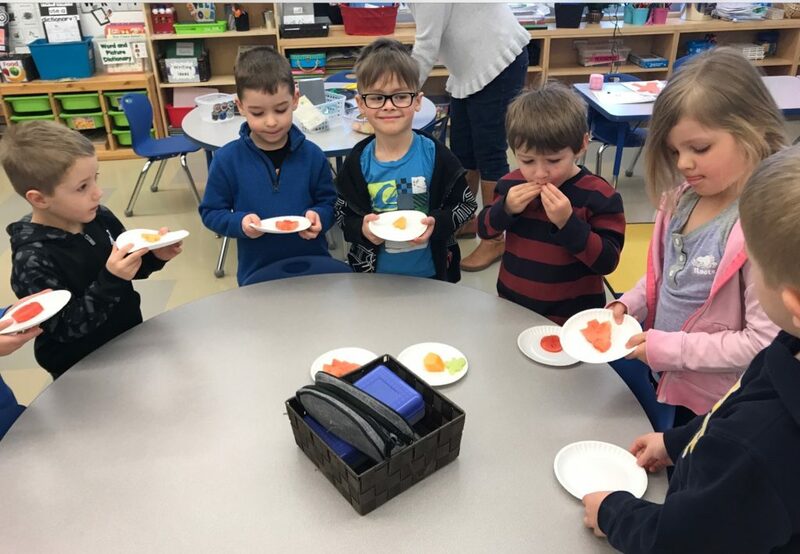 Ms Bardswich ‘s class made fruit salsa. We used a variety of fruit and it was delicious. The recipe got a thumbs up! 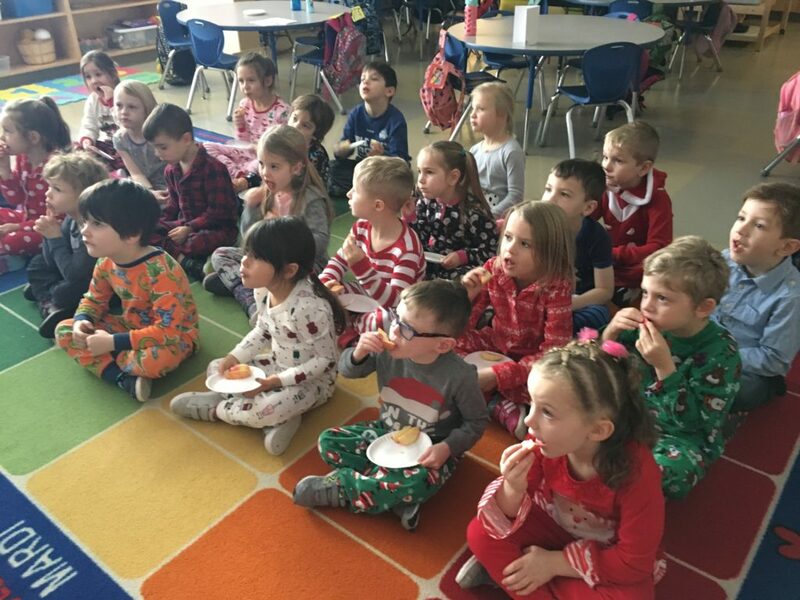 Christmas is near and our youngest Cubs enjoyed a PJ and movie afternoon. Instead of packaged and sugary treats they enjoyed fresh apple slices while they watched Alvin and the Chipmunks. We thought we would think out of the box for this next challenge. We have been teaching our students about healthy food and choices so we thought we would put what they learned to the test. We asked via our Facebook page to show us what our Cubs have been cooking. The results were amazing. So many pictures were sent to us that we are still trying to get them all posted. 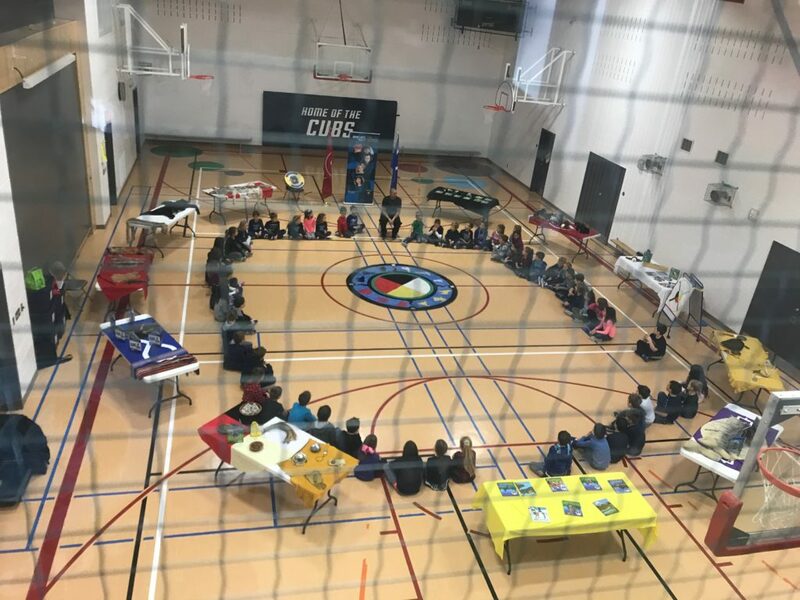 Thank you Cubs for listening and thank you to all our families for keeping this initiative going. Our end result is the same , we want healthy kids! We are constantly trying to provide healthier choices for our students. 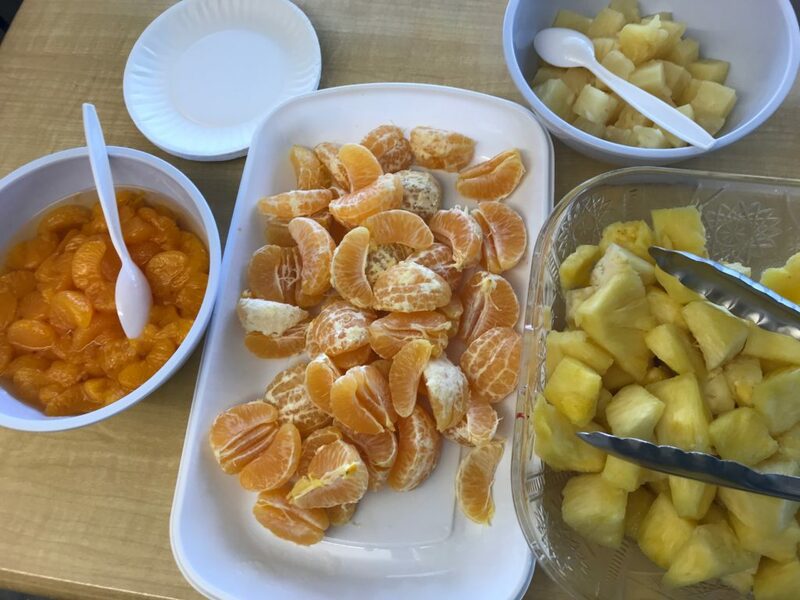 For those students who need an extra snack we always have a bowl of fresh fruit ready at the main office .Some days we may have apples or bananas and recently mandarin oranges. Thank you all the parents who have dropped off fresh fruit for our bowl. Anytime we have a guest in the school we invite the kids to have lunch in the gym. This gives them a change from eating in the classroom. Our last visitor was Joel, Aboriginal lead for the primary schools. The students are so engaged when listening to him, they enjoy to hear his stories. Joel ‘s approach to the students is calming. He always leaves them with a positive attitude. Mme. Maschio’s FDK class has been listening to music during lunch this year. It add a calming atmosphere to the busiest of the bunch. Recently they have been playing soft Christmas music. It provides comfort and the kids feel happy. Thank you to all our lunchroom supervisors. You help guide our Cubs in making the best and healthiest choices with their lunch. You encourage them to eat healthy everyday by choosing fresh fruits and vegetables and offering students fresh fruit to those who don’t have any. 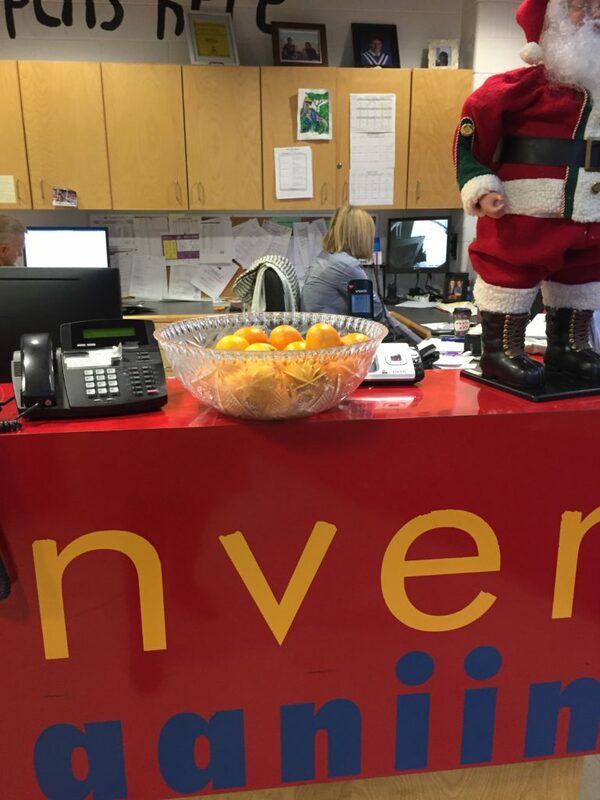 A fresh bowl of fruit is always ready at the main office for those who choose. The students helped prepare their snack for their class. instead of preparing just a regular tray of fruit the assembled an Christmas ornament. So much creativity. Adding fruit to a snack is a great idea and even better when you prepare it yourself. 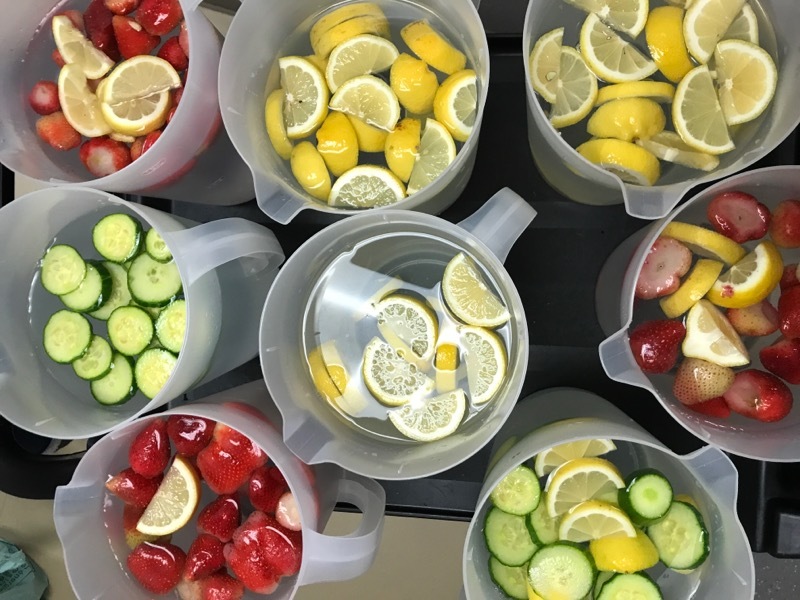 With the help of our snack committee and recipes from Sip Ontario we served all of our students flavored water. The water was flavored with strawberries, blueberries, slices of oranges, lemons and cucumbers. We plan to make this a regular item served with our snacks. When we return from Christmas break the students will help choice more recipes that they would like to try. 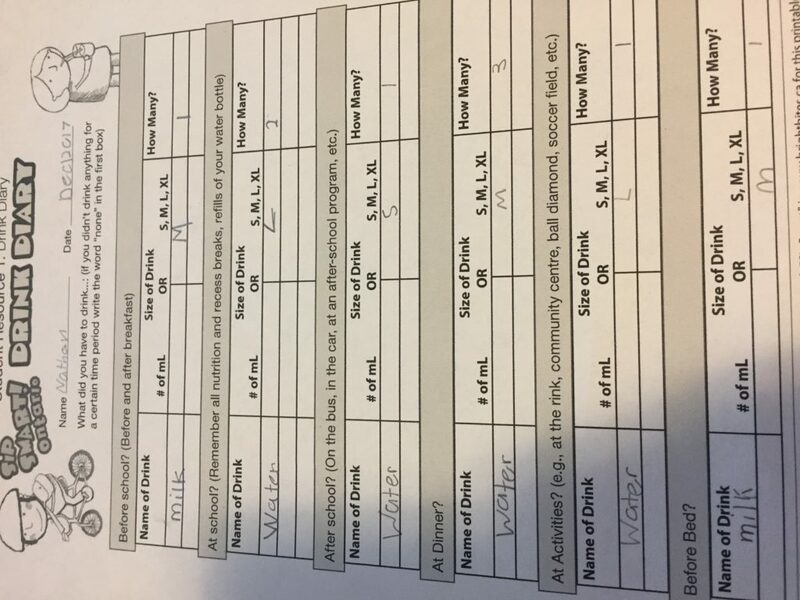 The students filled out a drink diary for their Sip Smart Ontario lesson. We had to share Nathan’s. He does a great job leaving the sugar out of his drinks. We used his diary as an example for other students to learn from. Nathan says he likes to play hockey and he needs to keep his body healthy and fit to play well. 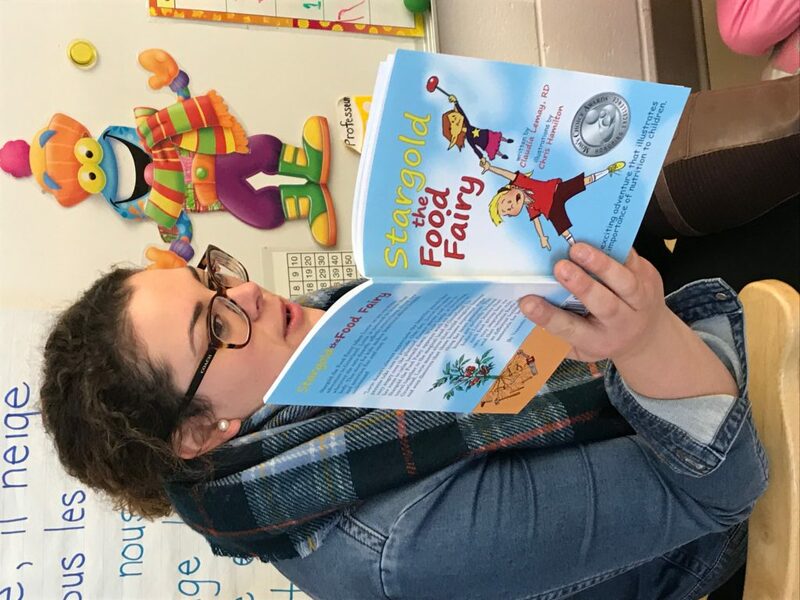 Today we received a copy of ” Stargold The Food Fairy”. Ms. M read the book to Mme. Maschio’s class. This was a cute story that help the students make a connection to healthy eating. They learned how important healthy food is to our growing bodies. We neede a fundraiser for the Grade 6 year end trip. Last year we sold candy kabobs this year we made a change and decided to sell popcorn. 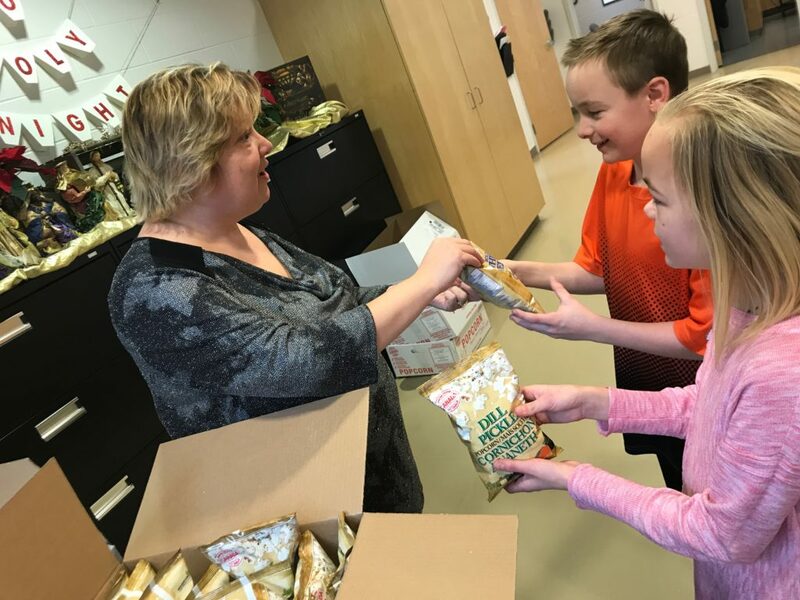 The students had the opportunity to buy a bag of popcorn during their lunch break. Today was the last pizza day of the year. 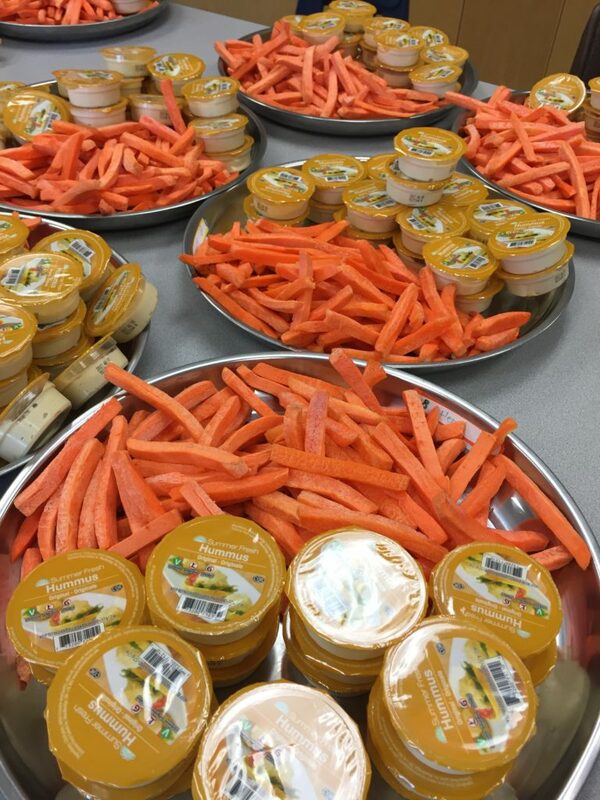 To make our lunches healthier we gave classrooms bowls of fresh vegetables to eat with their pizza. 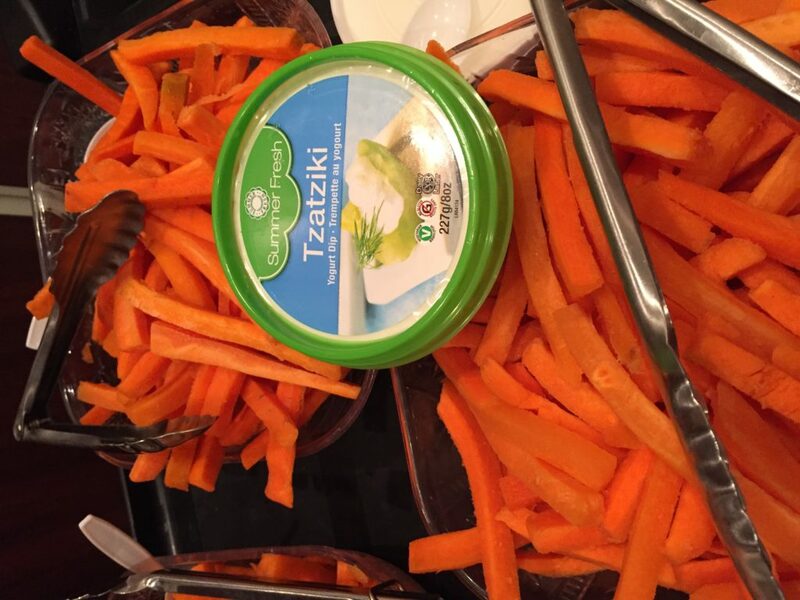 We are always encouraging our Cubs to add fresh fruit and vegetables to every snack and meal. 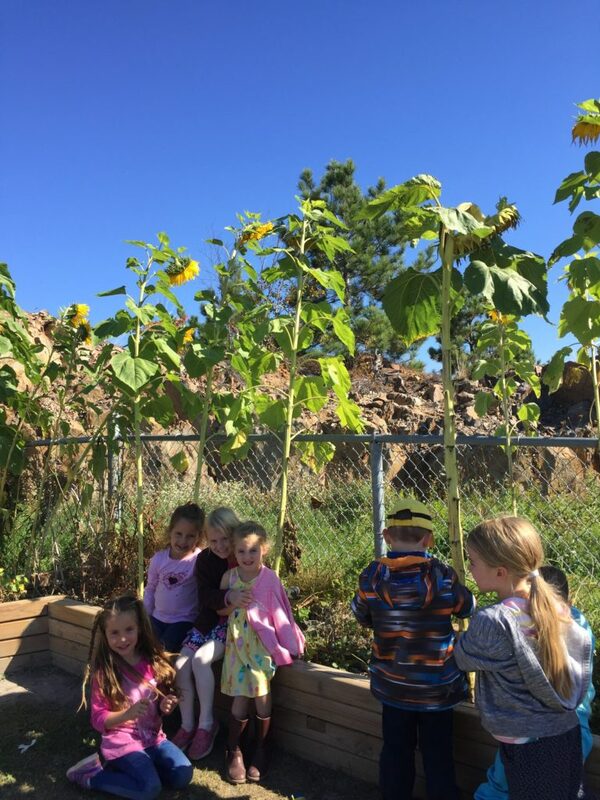 In the spring the students planted a garden with green beans and sunflowers. We watched the sunflowers grow and grow until all the seeds appeared. We left the seeds to dry and then we tasted them. I think of few of our teachers and students definitely have green thumbs. Look at all those seeds! 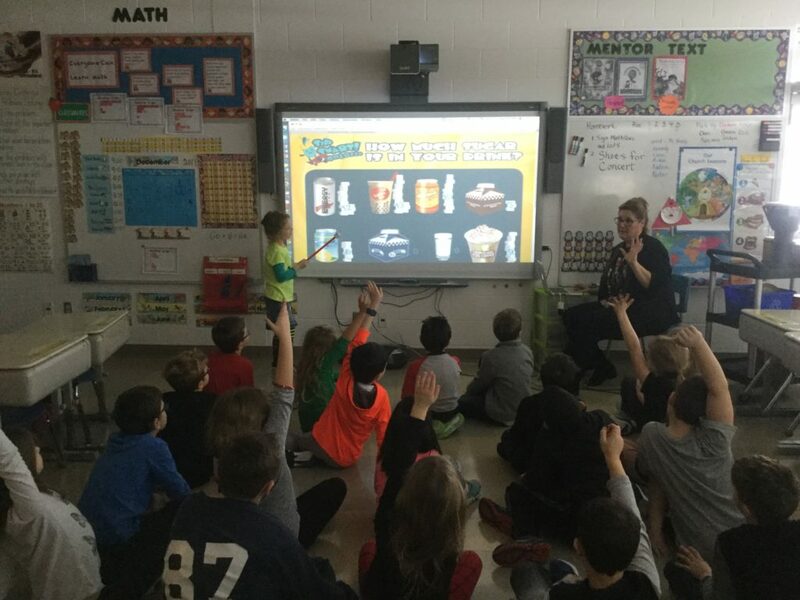 Ms Ceccarelli taught a class all about what they drink. The students were surprised to find out how much sugar they have been drinking. They all decided to leave the sugar behind and drink more water. 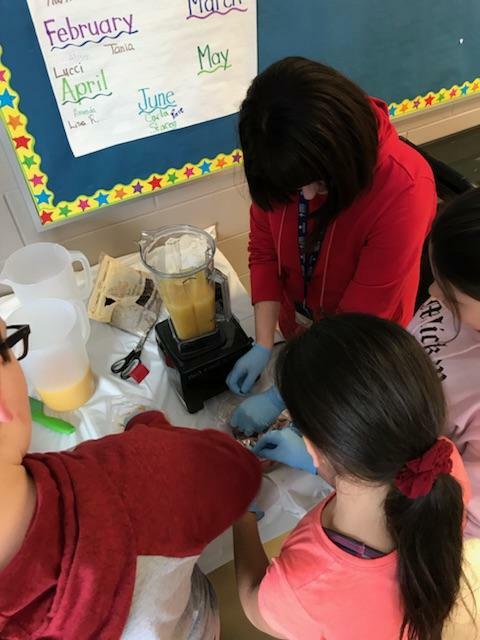 Our Grade 6 students learned how to make smoothies using the frozen bananas and strawberries that were left over from last weeks snack. The also learned about how to use the blender safely and how to clean and prepare their cooking station. The class was thrilled to try these out. 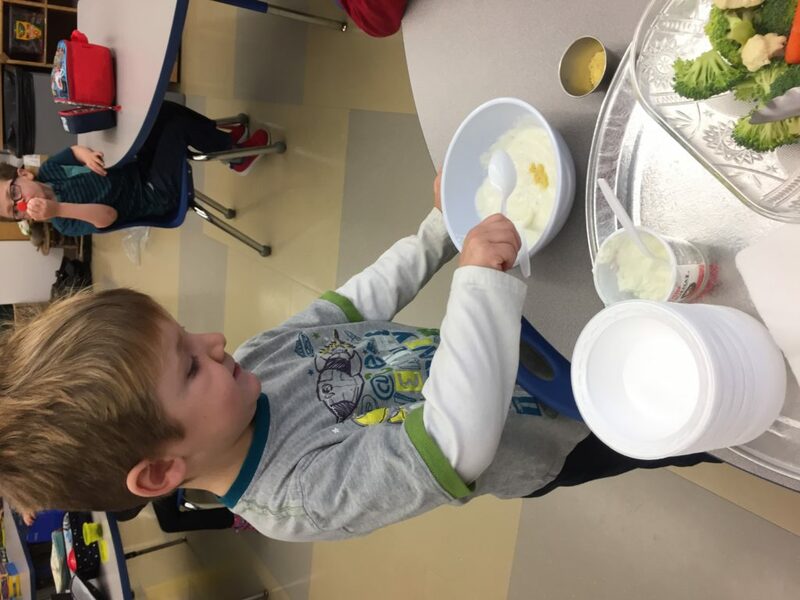 Ms. Reale’s Class created their own vegetable dip by using plain yogurt, cream cheese and a mix of spices. There secret ingredient was a pinch of dry mustard powder. They took turns adding and mixing in the ingredients. Our final” Good News Report” before the New Year. So many of our students show their great efforts to participate in class and help out classmates during the day. 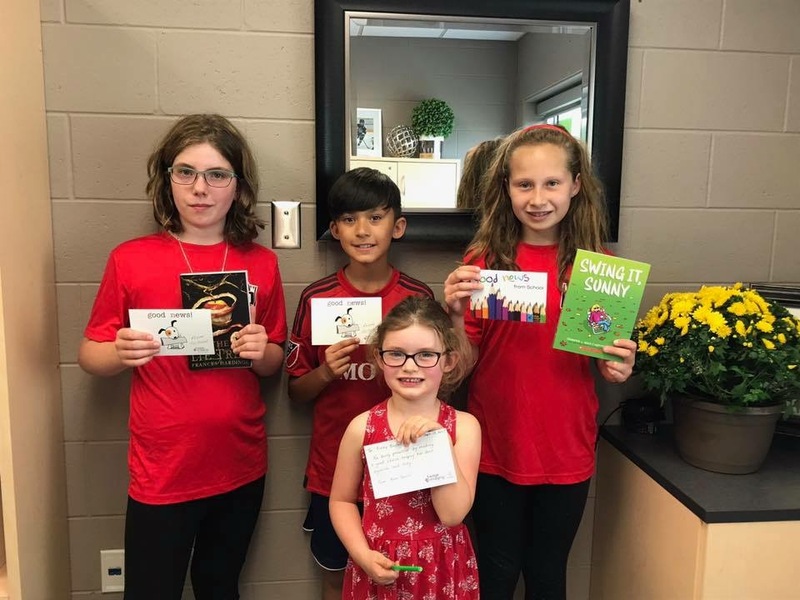 All these student were caught doing something great and they received prizes from our prize box and a Good News certificate to show what great things they have been doing. Great job! Happy Birthday ! A few of our cubs were celebrating a birthday. 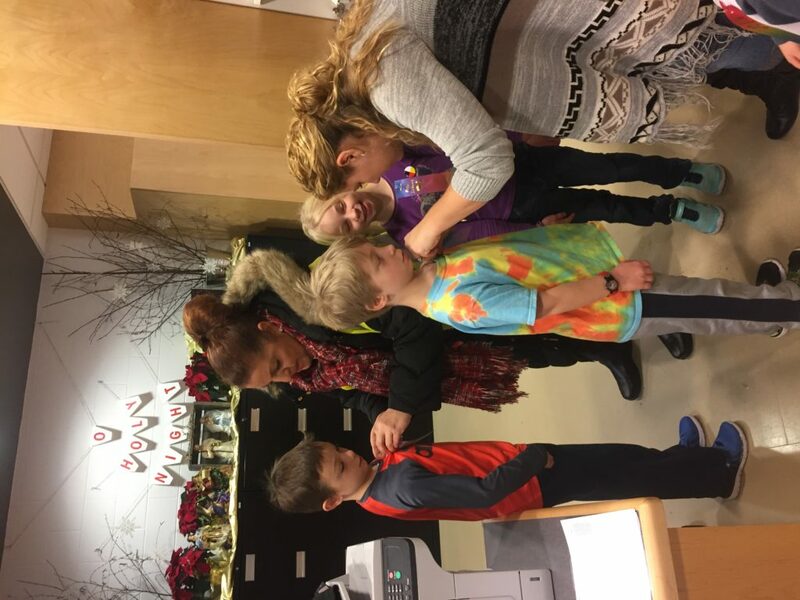 They received birthday ribbons to wear for the day instead of sugary treats. 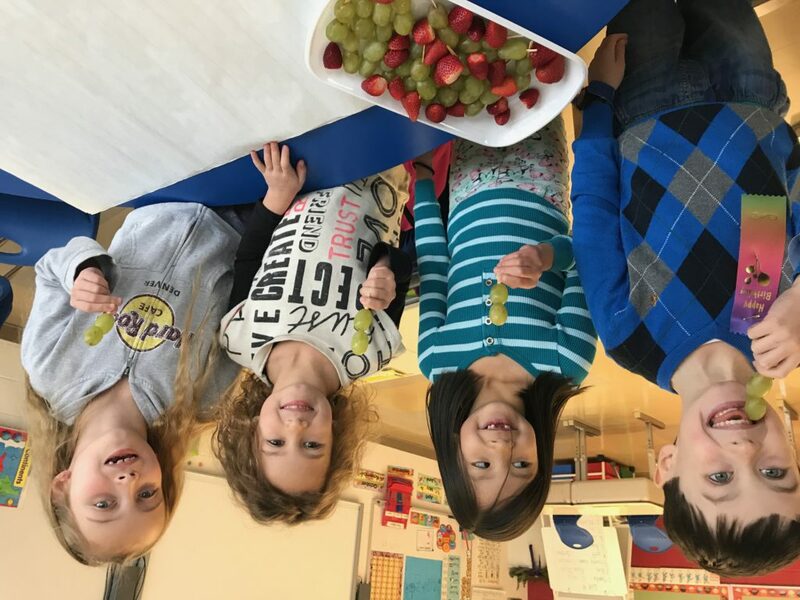 Ms. Visentin’s class had green grapes and strawberries for their snack. A few of our cubs had grape kabobs…or were they light sabers!?! Amazing how a little imagination can make a regular snack like grapes turn into something more exciting. We encouraged a few more Cubs to eat healthy. We all have our favorite fruits and vegetables. Mme. Mehes’s class had mandarin oranges and pineapple for a snack . They were given a challenge to try canned versions of the same fruit. They were both tasty and they had different opinions of what they liked best. Canned or fresh, this is another great idea to encourage more fruit and vegetables into every meal. We had a challenge for our grade 6 students in Ms. Rinaldi’s class. Fresh fruit vs frozen fruit. They tried frozen blueberries and frozen grapes. They also tried fresh blueberries and fresh grapes. 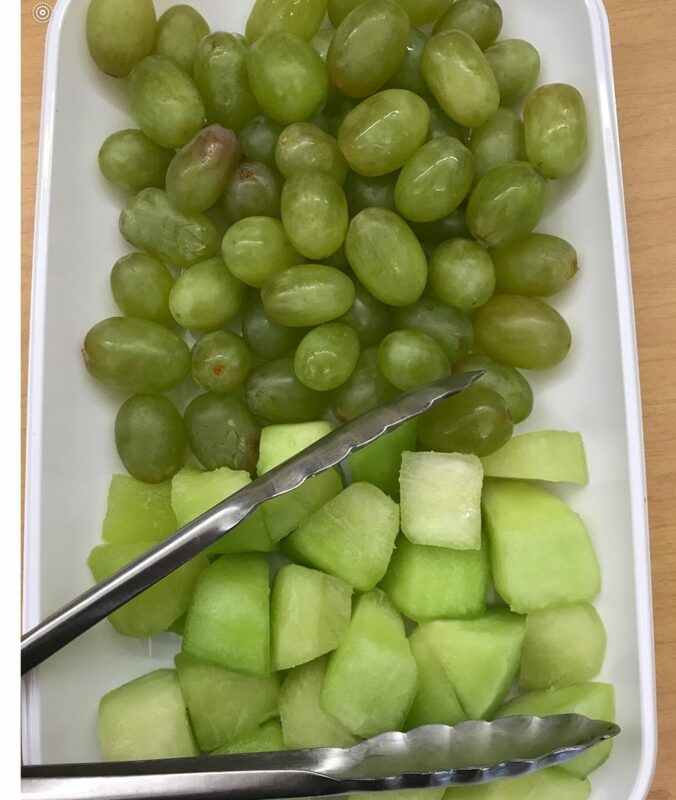 The class was surprised at how good frozen grapes. What a great idea! Most of us love apples, fresh and cooked. Ms. Romani’s class tried apples three way. They had fresh apple slices, applesauce and apple slices with cinnamon. We all put apples in our kids lunches but why not try something new. 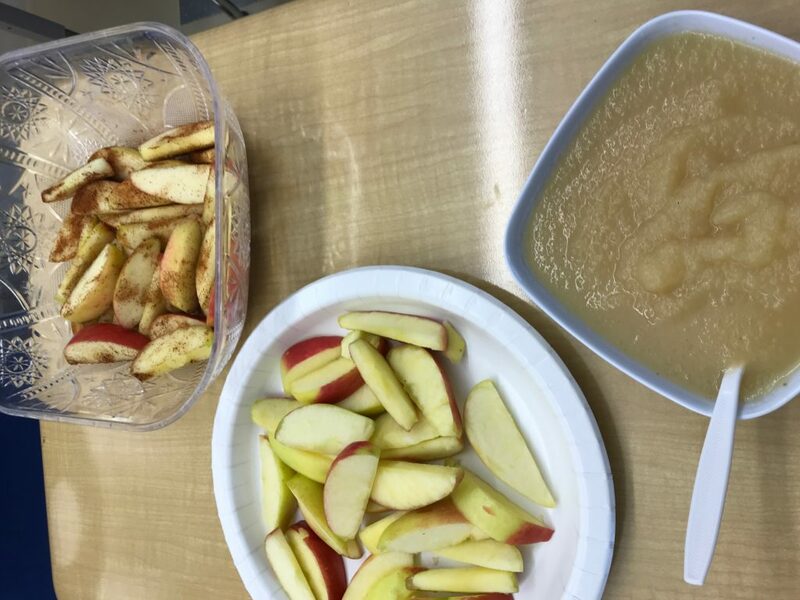 The class favorite was apple sauce followed by cinnamon apple slices. We had a busy day getting creative . Buses were cancelled , it was too stormy to go out but the students had fun being creative with snacks. We thought of different ways to decorate our Christmas table with fruit. 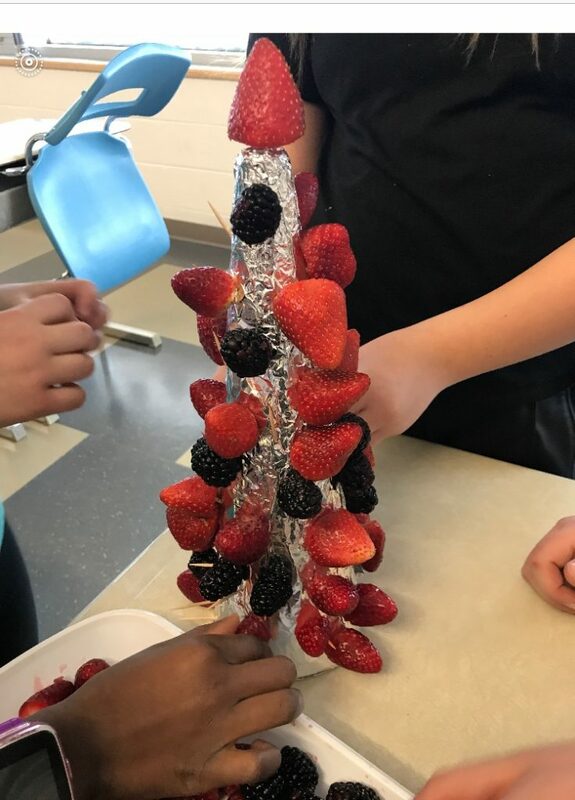 Ms. Bardswich’s class made a Christmas tree of berries. It was beautiful and tasty and a healthy was to bring fruit to the Christmas table. During our November “try something new challenge”. 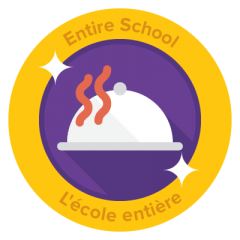 Each class, yes all 18 of them received a taste challenge. They tried pomegranate, cooked beets and persimmons. Some of these were new things to taste for both students and teachers. Everyone was challenged to try at least one thing and with no surprise to me most of them found something new to like. Way to go Cubs! Cookie decorating is such a big part of Christmas time. Mme. Henry’s class took on the challenge of decorating without cookies. They made a colourful wreath. It’s a great idea to serve fruit after a big Christmas meal as a dessert. Great work Cubs! Mme. 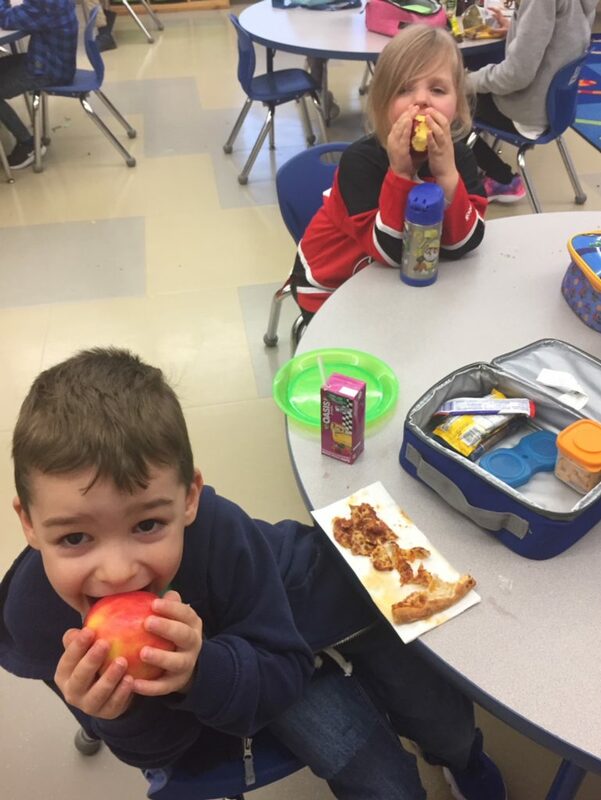 Maschio’s class enjoyed their morning snack. The fruit was shaped like gingerbread men , candy canes and Christmas trees. 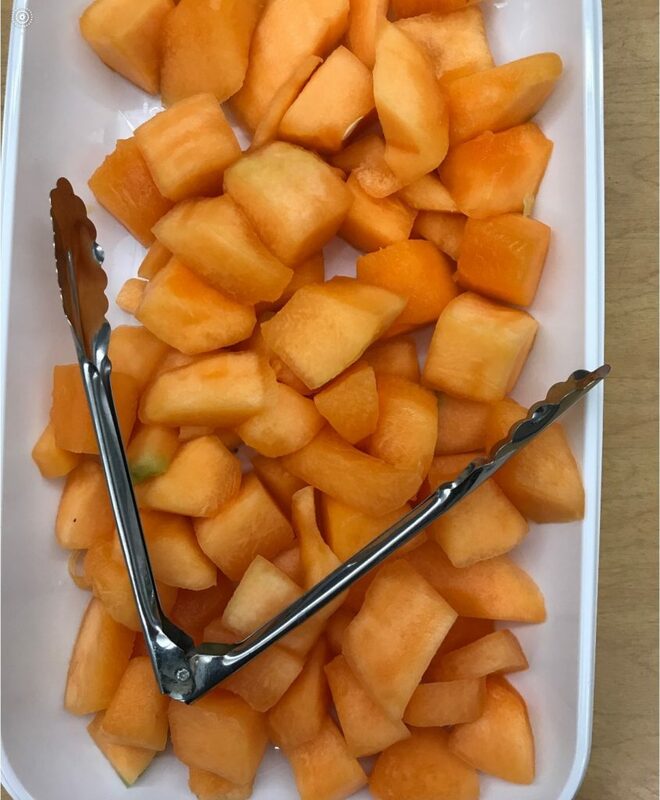 We cut up melon in cubes and mixed it in with the shapes. We created a search and find with our snack. The students were very excited to try their snack. Just another great idea to try different types of melon. 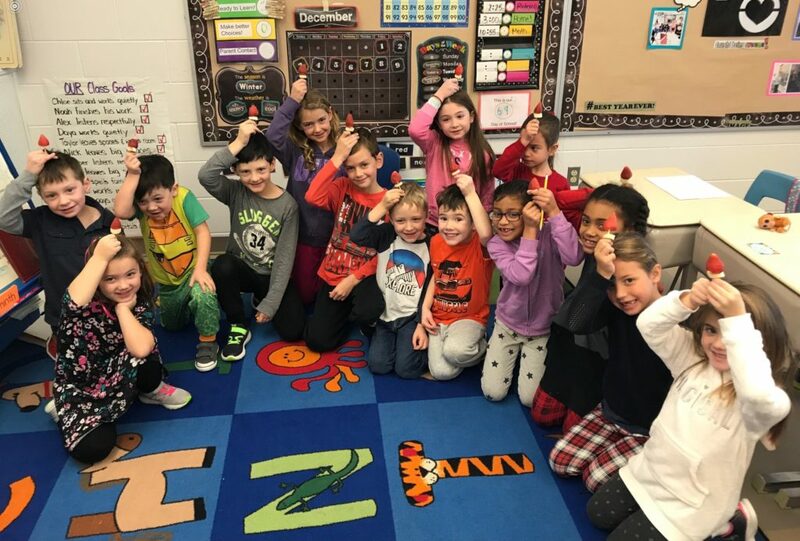 Rudolph with your nose so bright…These students took a bite out of watermelon that was shaped like a red nose. Using our imagination to make eating healthy fun. 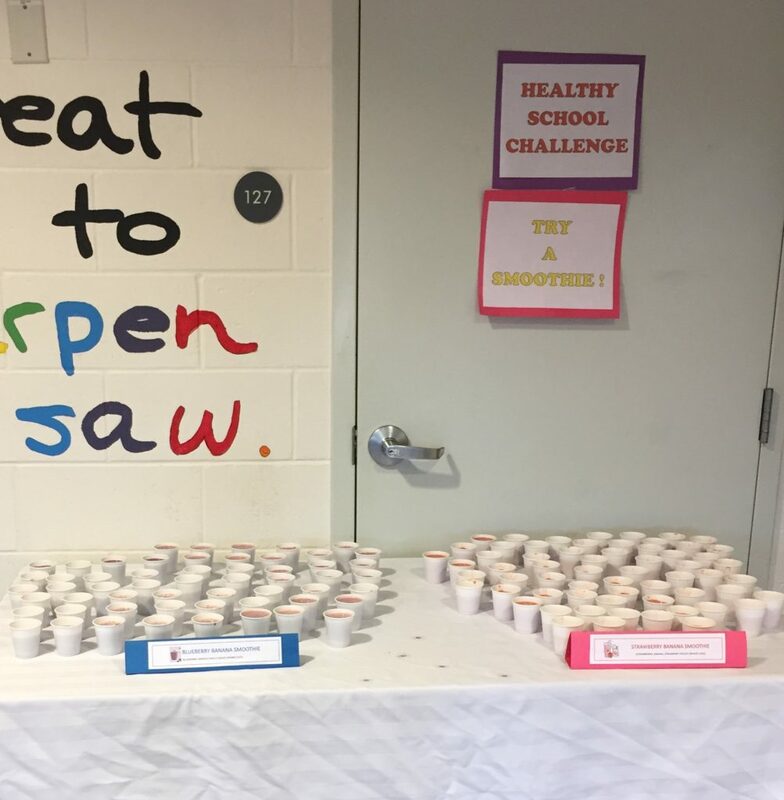 Encouraging our students to make healthy choices is something that is important to us as teachers and parents. This was a very fun way to do it! Getting our students to make healthy choices all the time can be difficult especially during Christmas time. Mme. Fay’s class had strawberry and green grape kabobs. Serving it in a different way like making kabobs changes the way the kids see the food. It’s no longer just healthy, it’s fun. 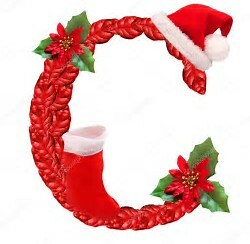 Continuing with our theme of C is for Christmas not Cookie. Some of our students were given colour themed snacks .Red is my favorite Christmas colour. 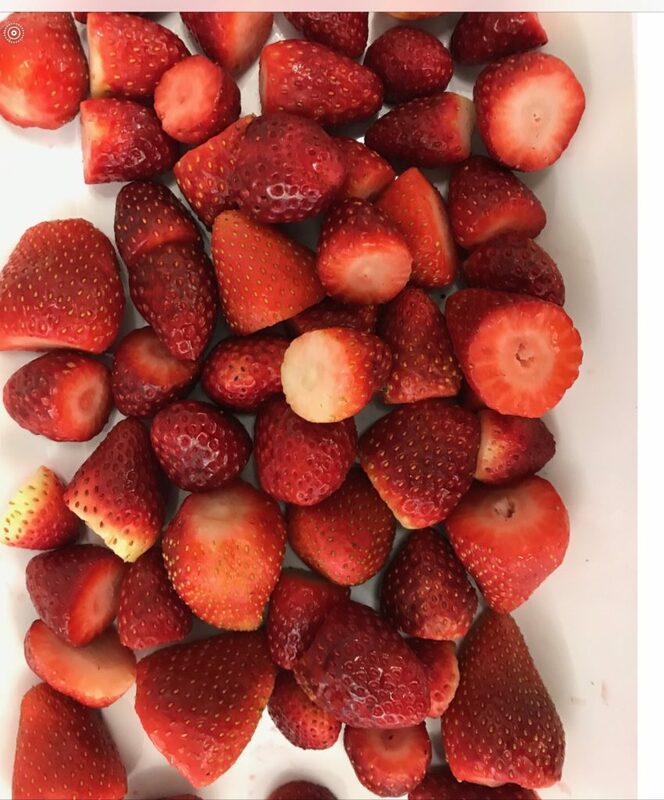 Santa’s red suit, big red ribbons on packages , Rudolph’s red nose and strawberries are what I think of when I think of the colour red and Christmas. 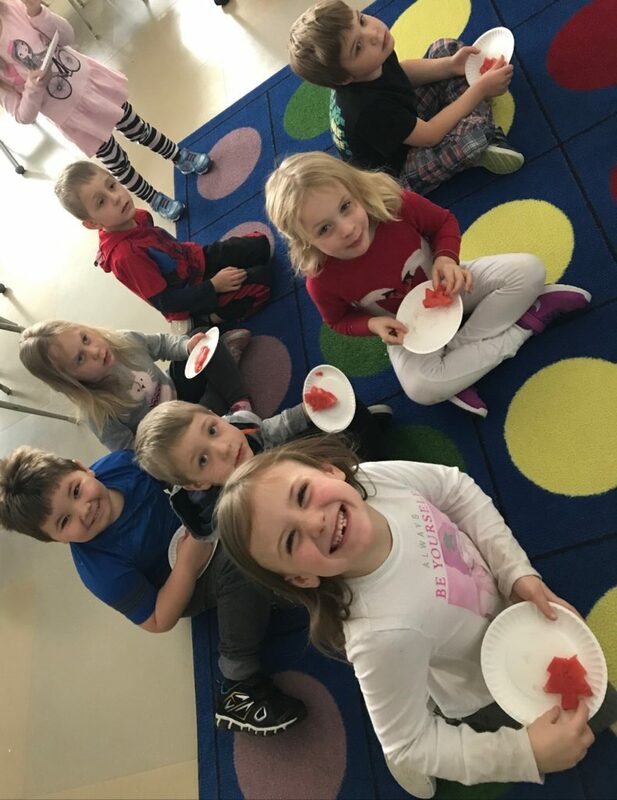 Ms. Petroski’s class enjoyed a tray of fresh strawberries while watching the snow fall outside. We continue to make great healthy choices while keeping it interesting too. Learning to make snack time more fun makes them want to eat more! What colour reminds you of Christmas ? 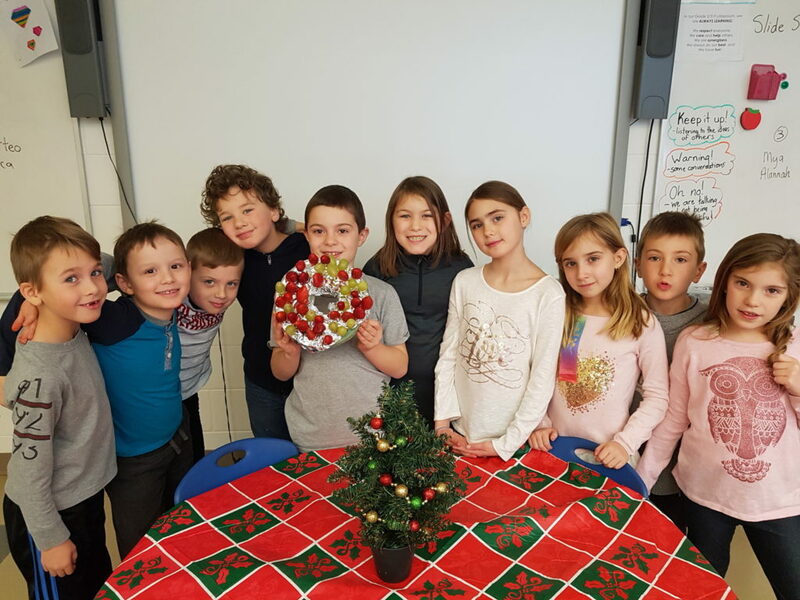 Ms. Lucciantonio’s class received red and green as there Christmas theme. Green grapes, honeydew melon and strawberries were their Christmas snack. It didn’t only look beautiful but it tasted great too! 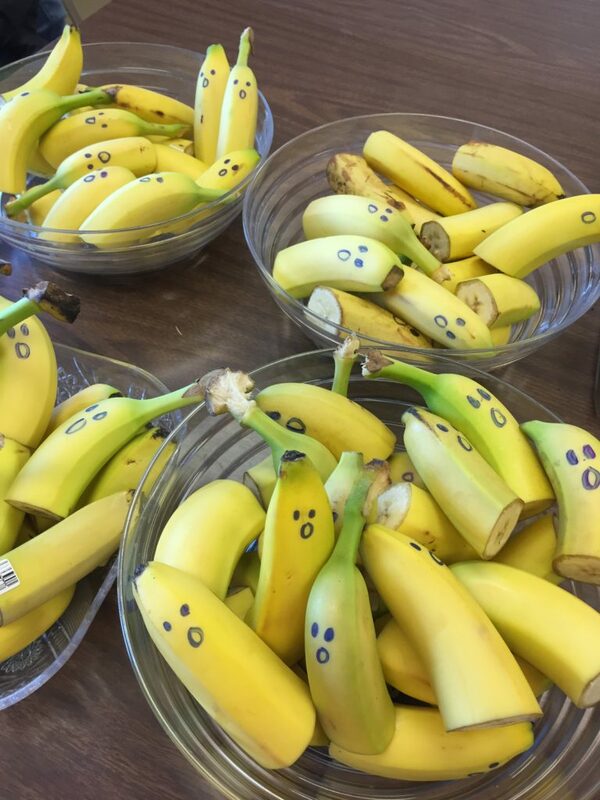 Making it fun for our cubs to encourage them to eat more fresh fruit . With our buses cancelled our students were given Christmas themed snacks . 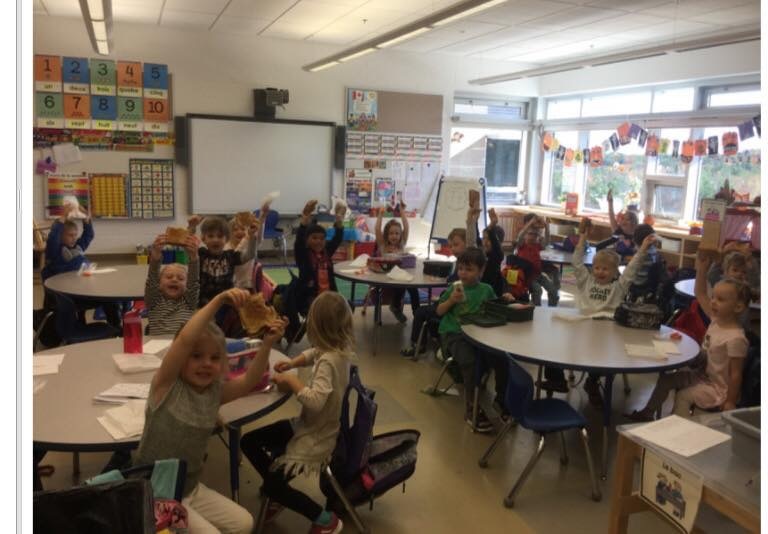 Ms Whalen’s class was given green grapes and honeydew melon. Green has many connections to Christmas like a Christmas Tree Or the Grinch. Another way to make snack time fun. What can you think of that goes with this green theme? Mme Riutta’s class discovered that C is not always for cookie. They snacked on cantaloupe. Staying inside all day during a snow day can be dull and boring. Having cantaloupe can brighten your day. Our cubs are making healthy choices and discovering that healthy can be fun! 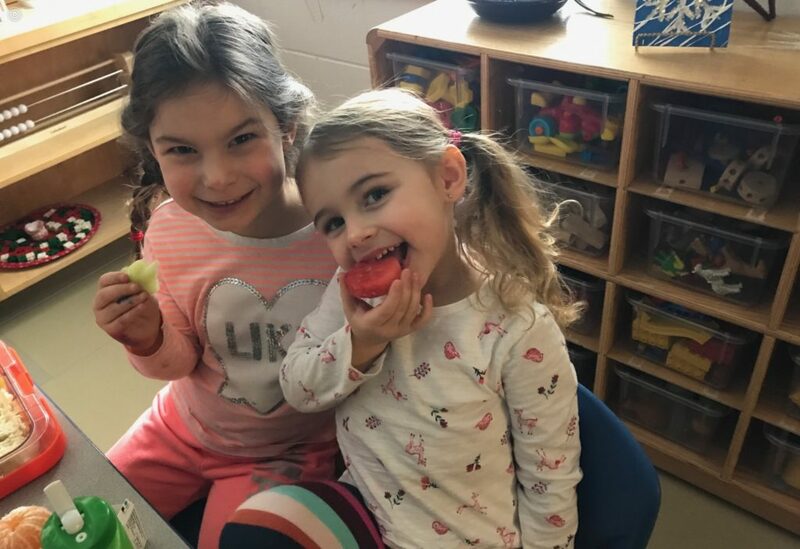 Mme Gaulin’s class enjoyed fruit kabobs. Such a simple thing but somehow this was more exciting than eating fruit out of a bowl! 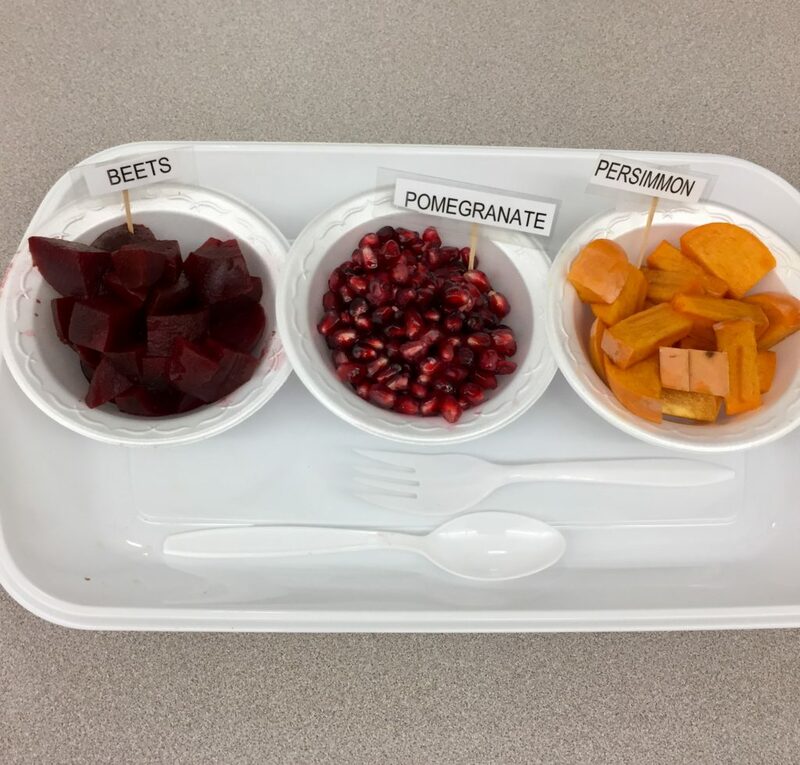 Great way to present fruit in a more interesting way and encourage student to engage in tasting something new. 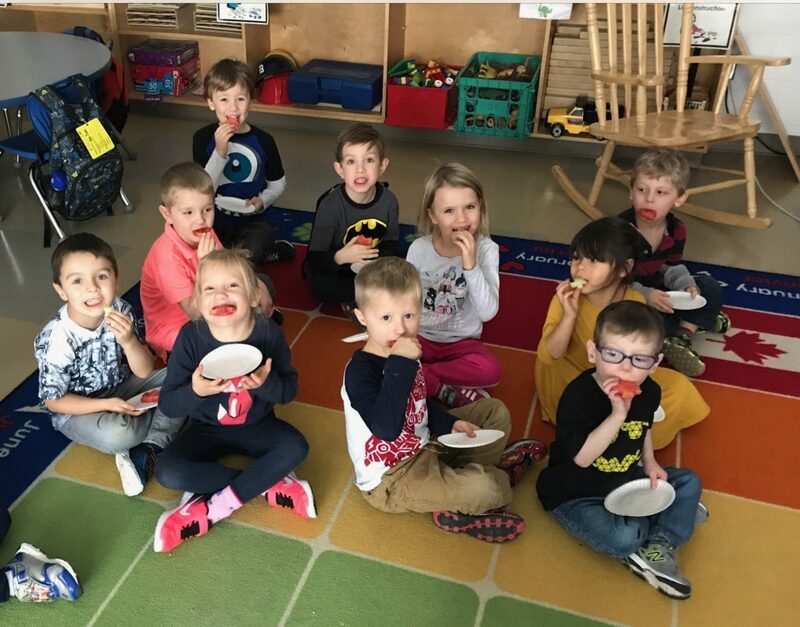 Mc Cull’s class had strawberries and bananas for snack. Santa Hats! What a great idea and a fun way to eat fruit! MS Real’s FDK class had watermelon Christmas trees, cantaloupe gingerbread men and honeydew Rudolph noses. Just as good or even better than cookie! So sweet and delicious. Great ideas from our cubs! 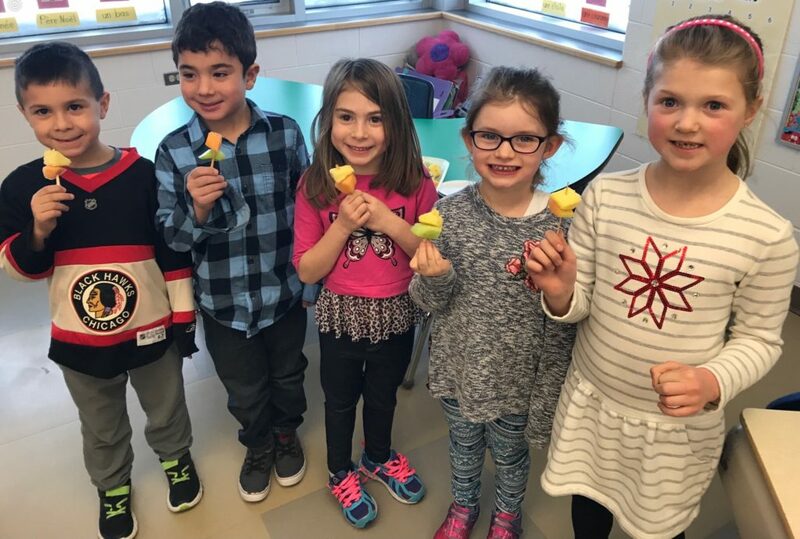 Mme Belanger’s class tried special Christmas shaped fruit for their snack. Christmas is coming, no cookies for snack today. Our little elves thought they would save the cookies for Santa ! Too much snow led to buses not running. We thought of a fun way to get creative on a day that could be boring. 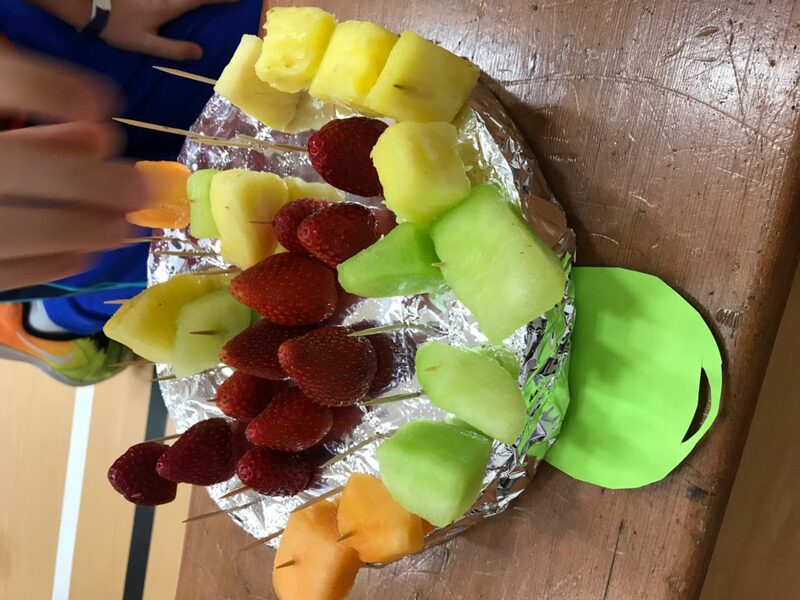 Every class received a healthy snack as usual but with a twist. Christmas always brings sugar treats , we decided to make fruit our special Christmas treat. Our challenge was “C is for Christmas not cookie!” Each class had a Christmas theme and some students put there decorating skills to the test. We had a wonderful school Council meeting. We love to parents engage in what is going on in our school. We also like to enjoy each other’s company . We served a healthy meal of garden salad and wood fired pizza. We also provided either bottled water or sparkling water to keep hydrated. 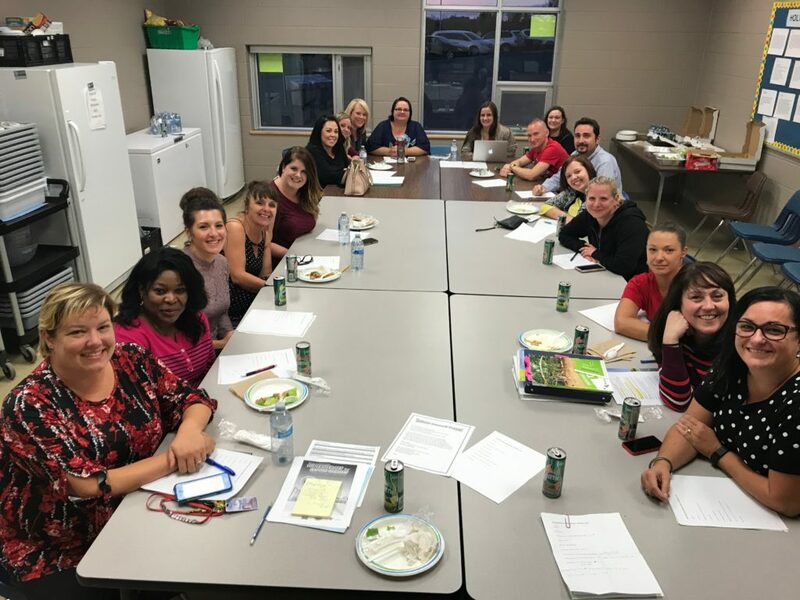 Thank you all parents who come out to our meetings and give us great ideas on how to make our school better and for being great role models and choosing healthy foods. 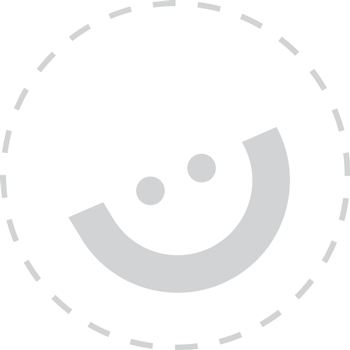 Our reward box has just been topped up! These are some of the prizes we give to students to celebrate their achievements. Everyone likes to be acknowledged when the accomplish something great. Picking something out of of the prize box is something the kids look forward to. 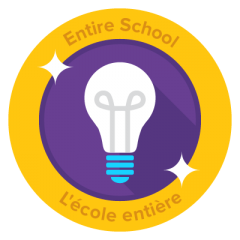 Every week we honour our students who did something extra special. They may have helped a friend or swept the classroom during clean up time or accomplished something new. We are always so proud of our students. The Grade 6 students participated in math activities. 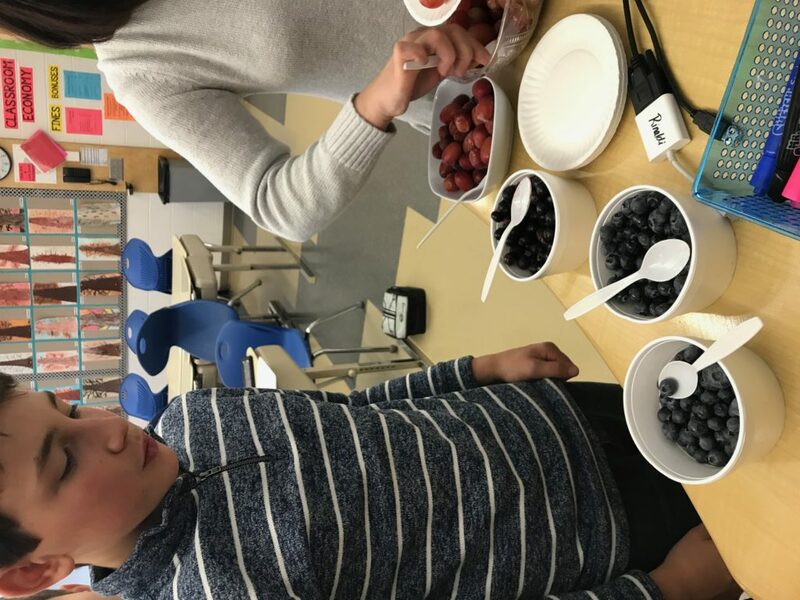 They were learning math through healthy foods. 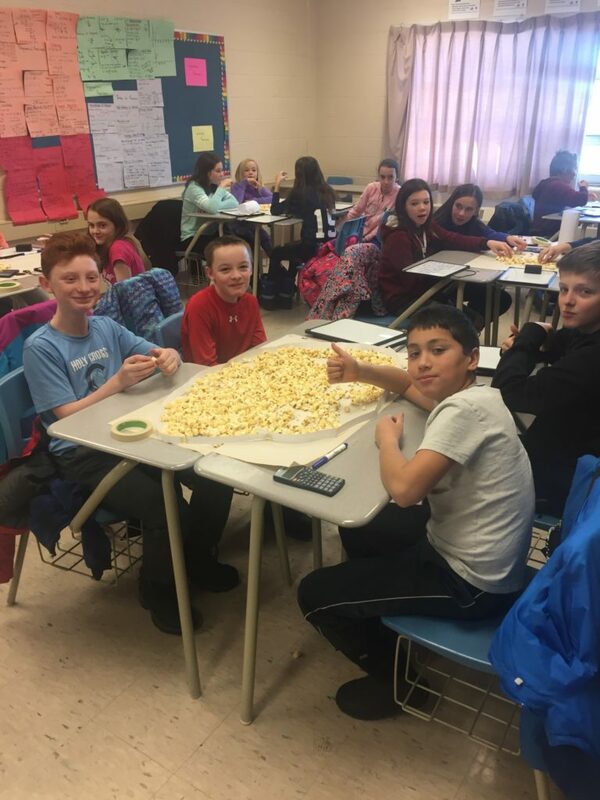 I’m pretty sure not all the popcorn was accounted for but it was a fun way to practice math and have a healthy snack at the same time. Thank you to St Ben’ s for organizing this activitiy. We love when our cubs have something important to share. Ollie from Mme Henry’s class was a true professional. He made daily announcements to challenge student to think and choose healthy snack. As every school knows extra funds to support our students is always needed. The funds are used to boost our snack program , pay for extracurricular activities for our students and so much more. Every year we try to come up with new ideas on fundraising without selling food items. 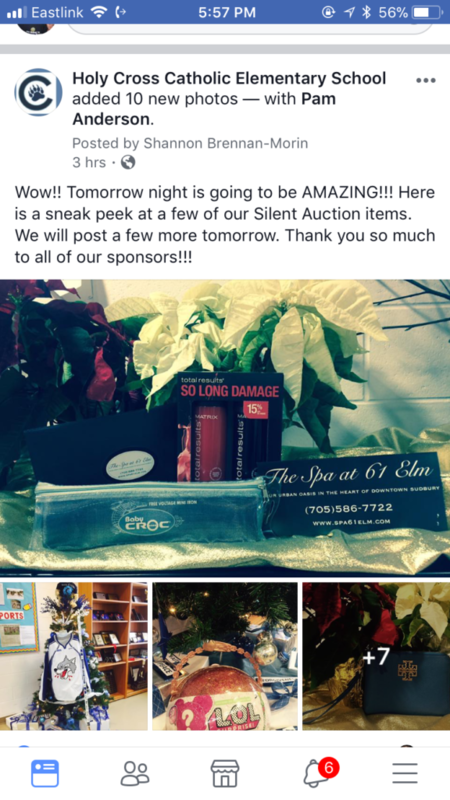 The VIP raffle is one of our most popular fundraisers . The winners receive 4 front row seats to the concert and a reserved parking spot closest to the entrance. 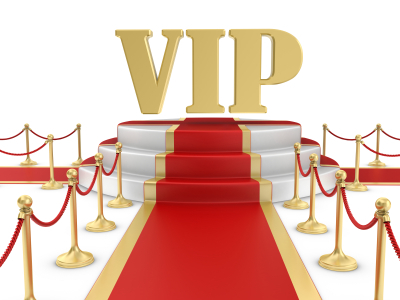 A true VIP experience! 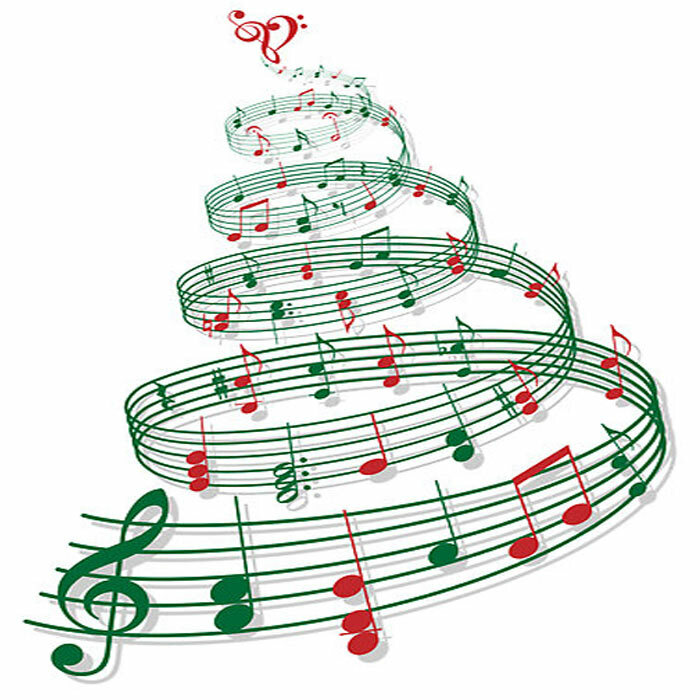 During our Christmas Concert, we will have a Silent Auction set up to fundraise for our Cubs. What a great event. We get to enjoy our children perform and show our Christmas spirit by raising a little money in support of our school. We are getting ready to start our Adventures in Cooking Club in the new year. Before we start we need supplies. 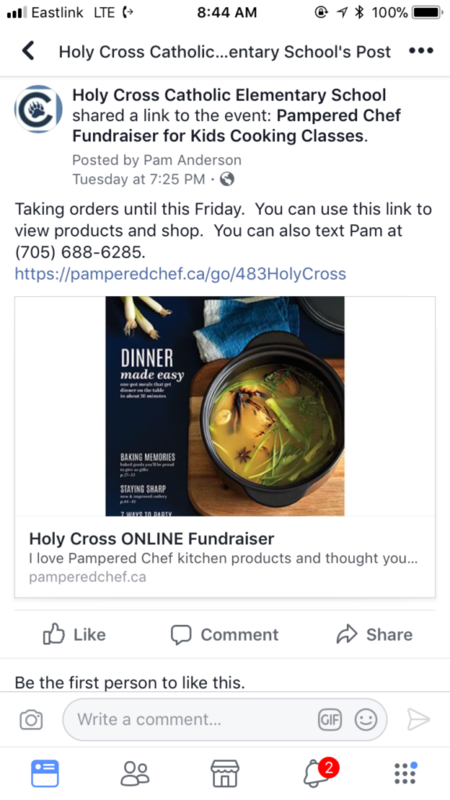 We decided with the help of a parent who sells Pampered Chef to host an online party . Through this fundraiser we were able to get supplies like knives , pots , pans, choppers and spatulas to use for our cooking classes and start teaching our cubs about healthy cooking. Thank you Pam for all your hard work! Freezing fruit is a great way to add it to a smoothie. 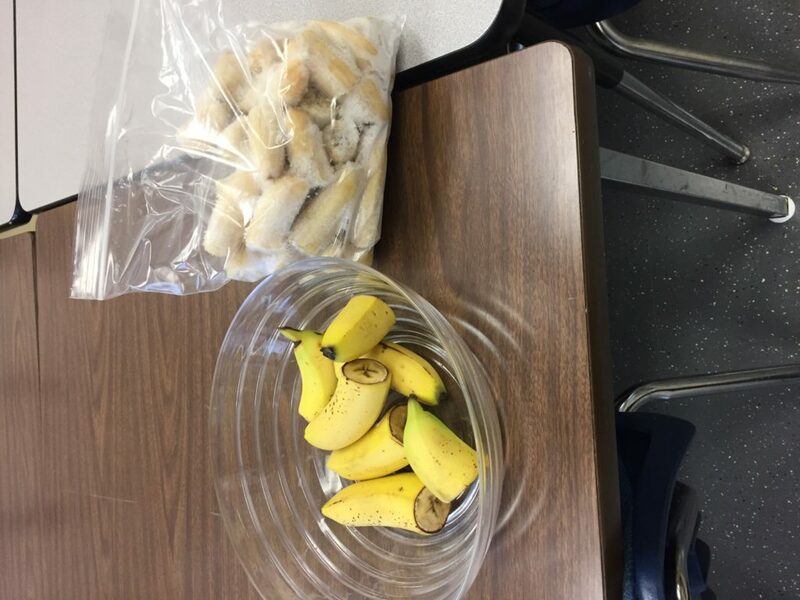 We took any left over bananas from our snack and froze them . 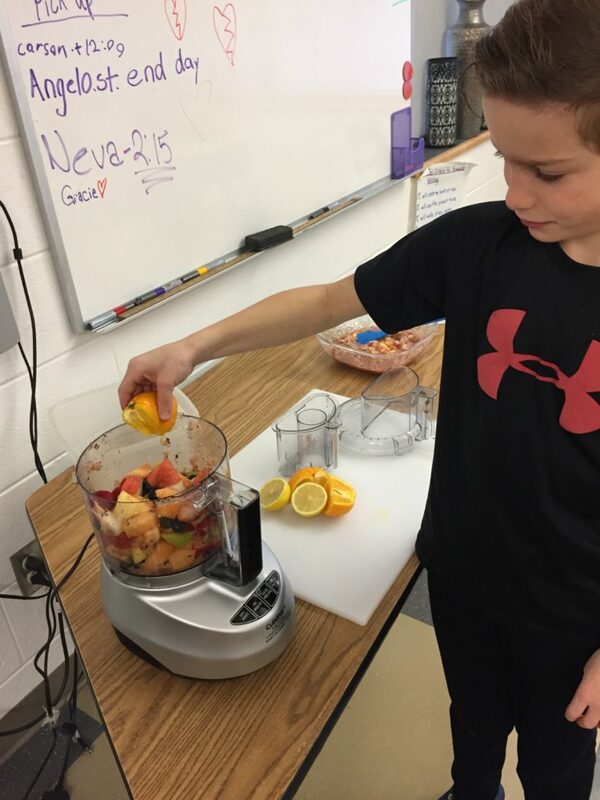 The students learn not to waste but to try fruit in a different way like smoothies. Our cubs look forward to every snack served.Thank you to our parent volunteers for making another hot lunch day better. This week orange slices for the entire school and staff, one of the kids favorites. 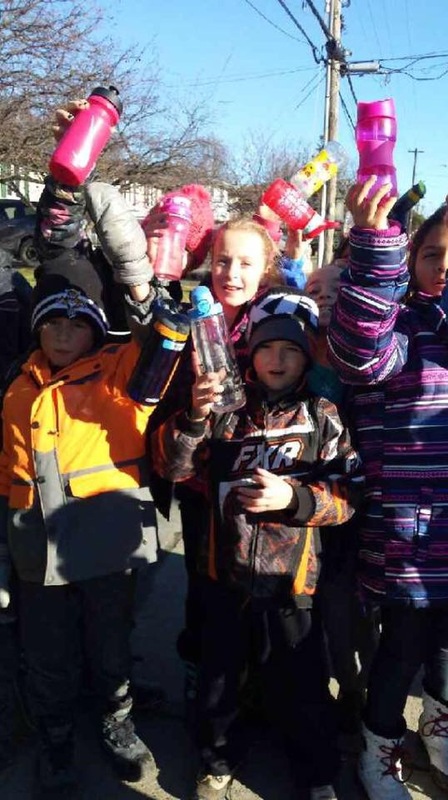 Ms. Whalen’s class took a walk with their water bottles in hand to the water station at Countryside Rd. It gave them to opportunity to learn that it is not so easy for some people to get water depending on where you leave in the world. They also became aware of how important it is to drink water to keep us healthy. It was a long walk but they have a new appreciation for every sip they take. Every time the Cubs Café serves a meal we always try to make it healthier. 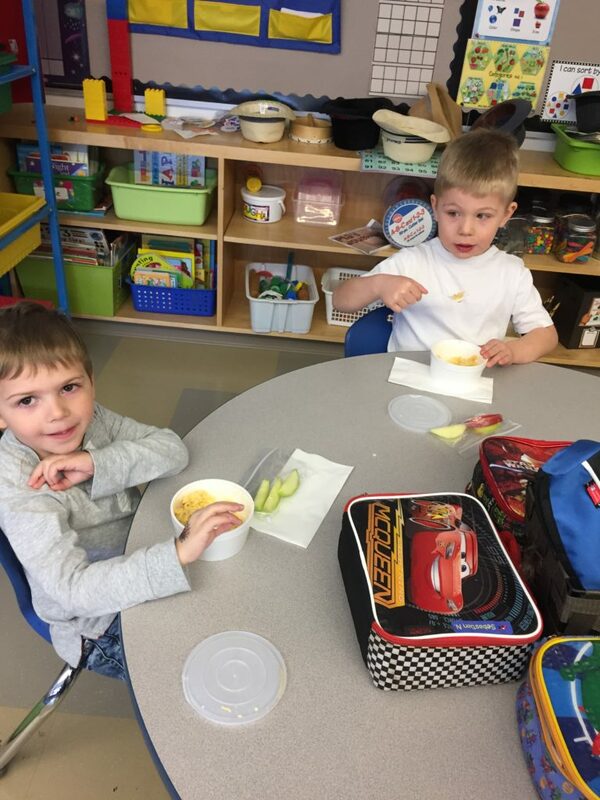 Adding apple slices as a side to our mac and cheese teaches the kids that including a fresh fruit or vegetable to every meal is important. 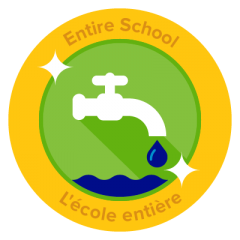 We are continuing to encourage our Cubs to make even more healthy choices at school and at home. A Hot Pasta lunch is great but we thought how could we make it better. 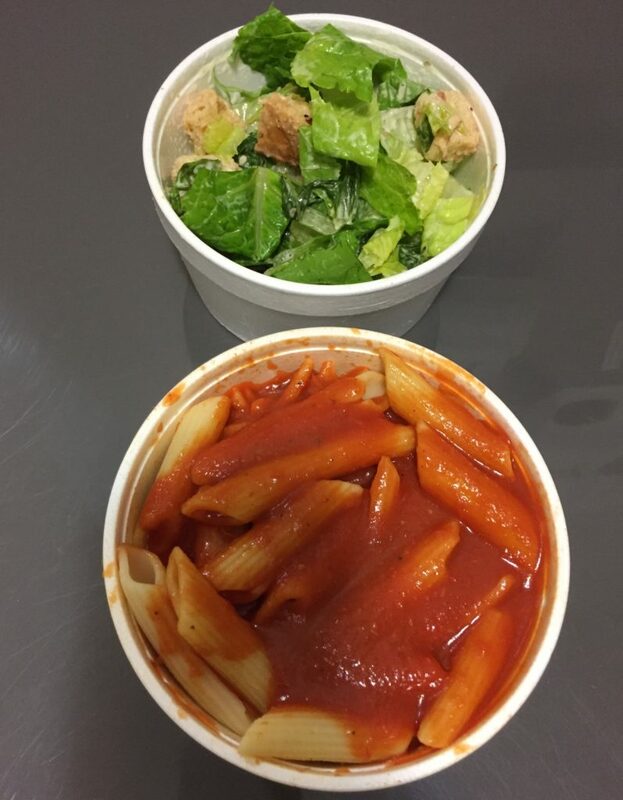 The Cub’s café served a hot pasta lunch, students were given the choice of a side salad. It was great to see even the pickiest eaters tried the salad. 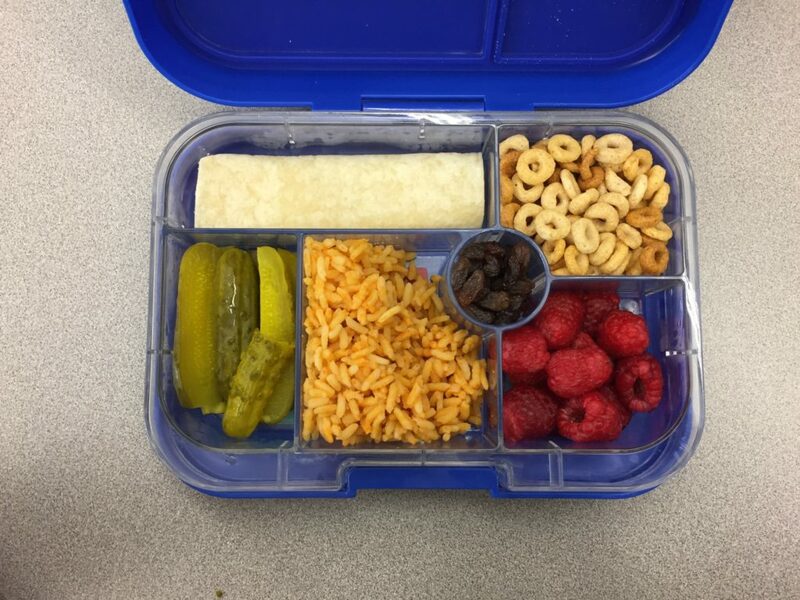 What a great balanced lunch to keep our minds focused for learning. The Cub’s Café served up another wonderful lunch. This time macaroni and cheese was on the menu. Not just any mac and cheese, homemade mac and cheese. This recipe was made from fresh shredded cheddar cheese, milk and butter. No pre packaged or take out here. Thank you to parent volunteers who help make this happen and a few of our cubs who helped shred the cheddar cheese and cook the macaroni. Our cubs cant wait to see what’s next on the menu! 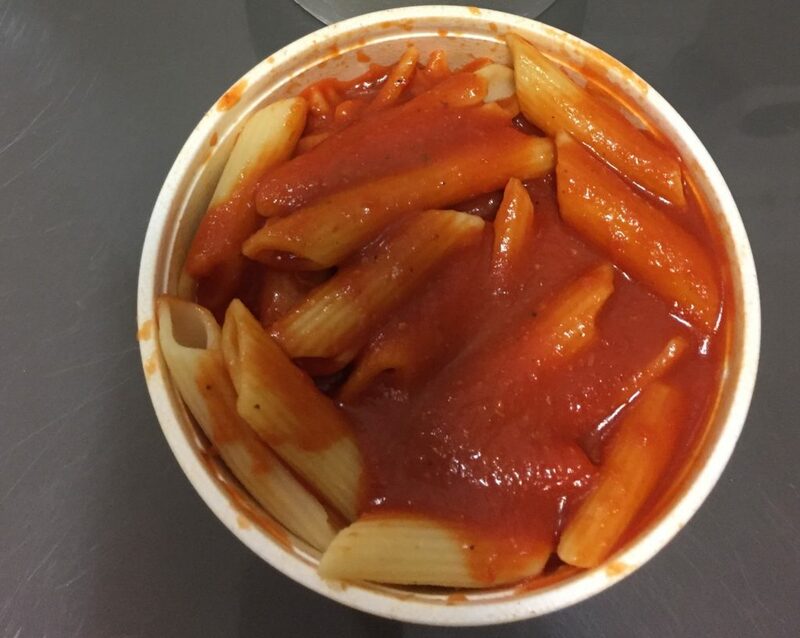 The Cub’s Café prepared a beautiful hot lunch of pasta and made from scratch tomato sauce. With the help from a few of our cubs and parent volunteers we served over 300 portions. Our cubs are learning that fresh and homemade sure tastes best…Just Like Nonna’s! Holy Cross has always tried to encourage healthy snacks. Thanks to our parent volunteers who help out every week to provide healthy foods to our students . Using social media we created a newsletter to update our families on all the hard work we put into our snack program. 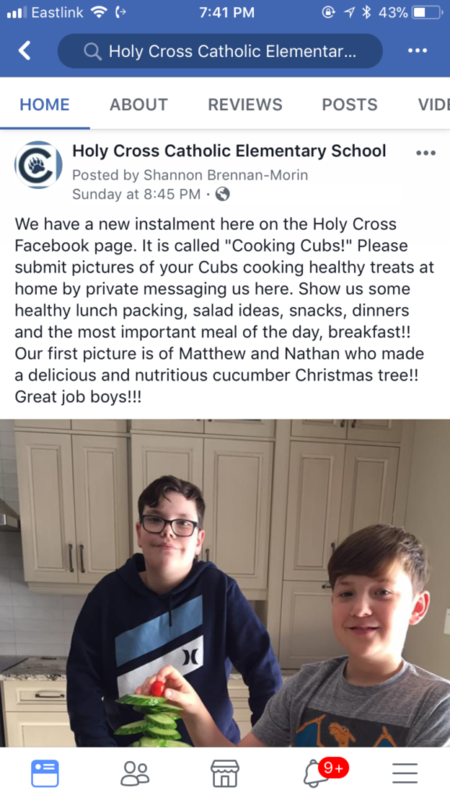 Our hope is that our cubs continue to choose healthy snack even at home. We challenged our students to a week of waste free lunches and they did a great job with it. The students were surprised at how easy it was to do. 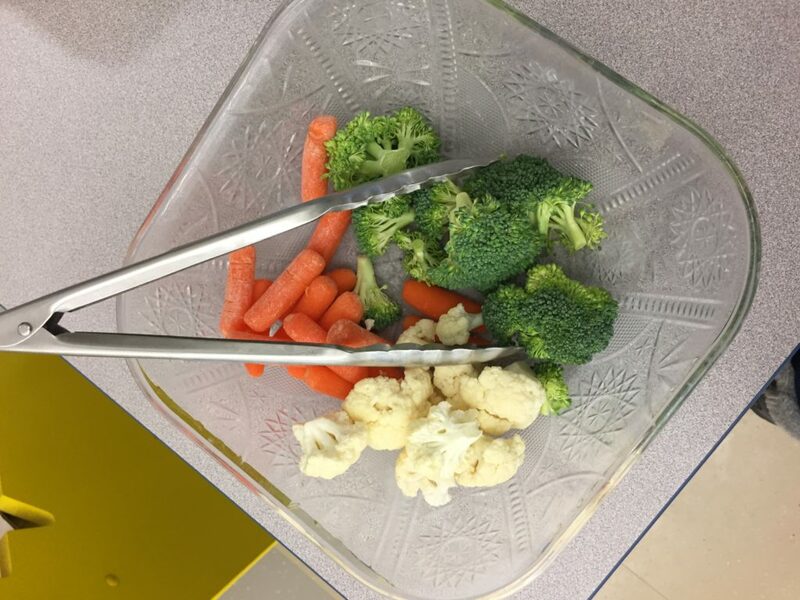 Our Cubs learned that by getting rid of prepackaged snacks, healthier choices were being made and they were eating more fruit and vegetables. Way to go Cubs! More Good News Reports! 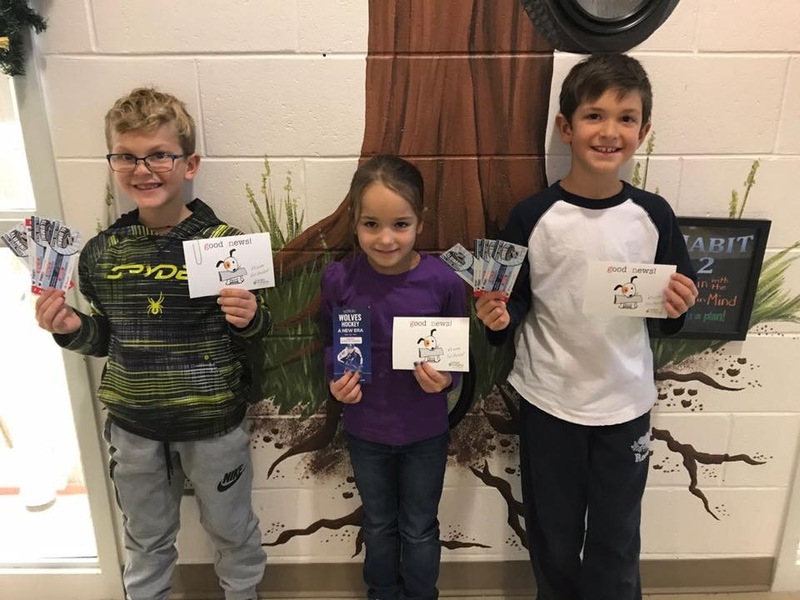 Some of our students were rewarded with Sudbury Wolves to celebrate their achievements. Great Job Cubs! Forget juice , Drink milk! 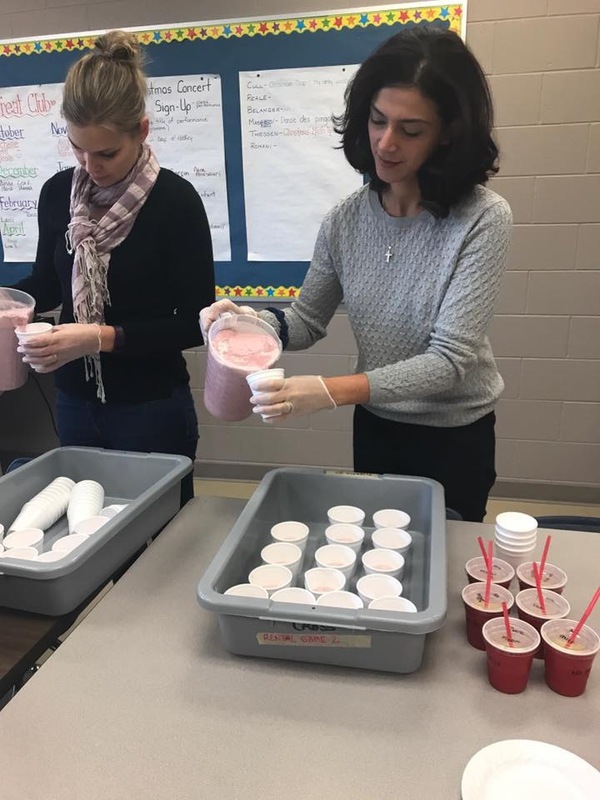 With the help of our parent volunteers our cubs enjoyed blueberry, strawberry and banana milk smoothies. This is a great way to get more fresh fruit and milk into our growing Cubs. Mission Accomplished! 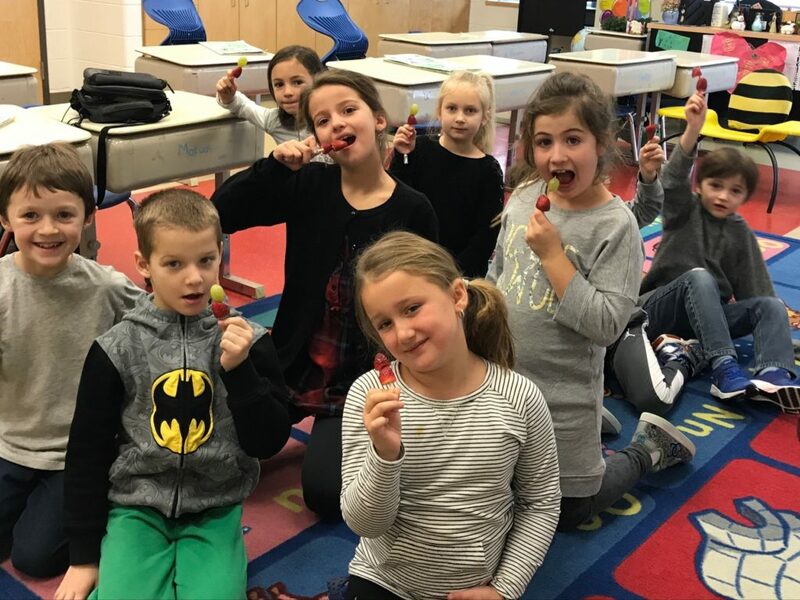 Ms. Reale’s class completed their challenge of leaving their candy at home and took a bite from fresh fruit and vegetables. Way to go Cubs!! 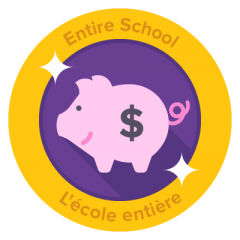 Fundraising is always a big part of every school. Halloween is over and we have already to start looking towards the Christmas season. 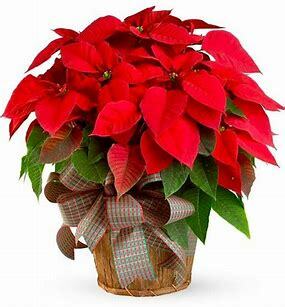 For our Christmas fundraiser our Cubs are selling poinsettias and beautiful wreaths . Hot lunch day is always a great day . 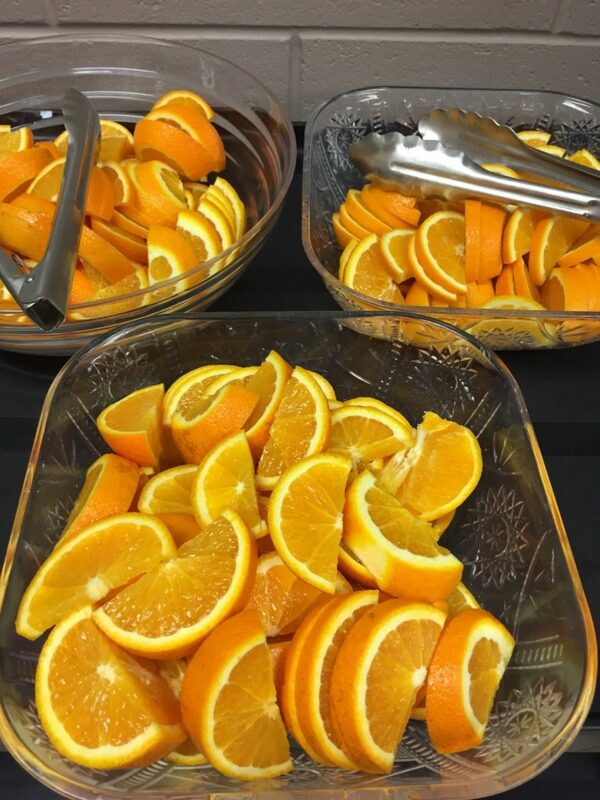 To make it even better we served fresh orange slices to all students . 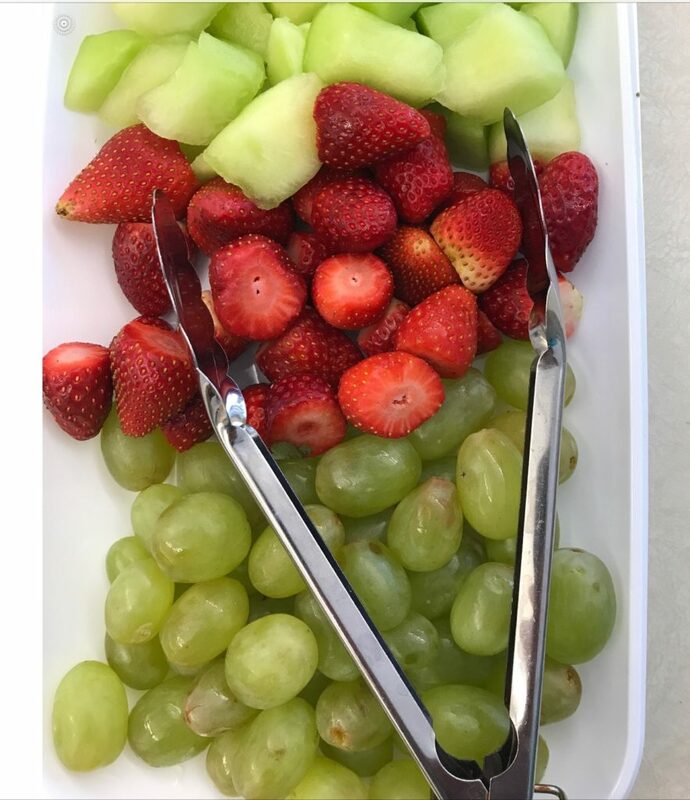 We are always encouraging our Cubs to include a fresh fruit or vegetable with every meal. Our Cubs were giving the opportunity to celebrate Halloween with ghostly treats. 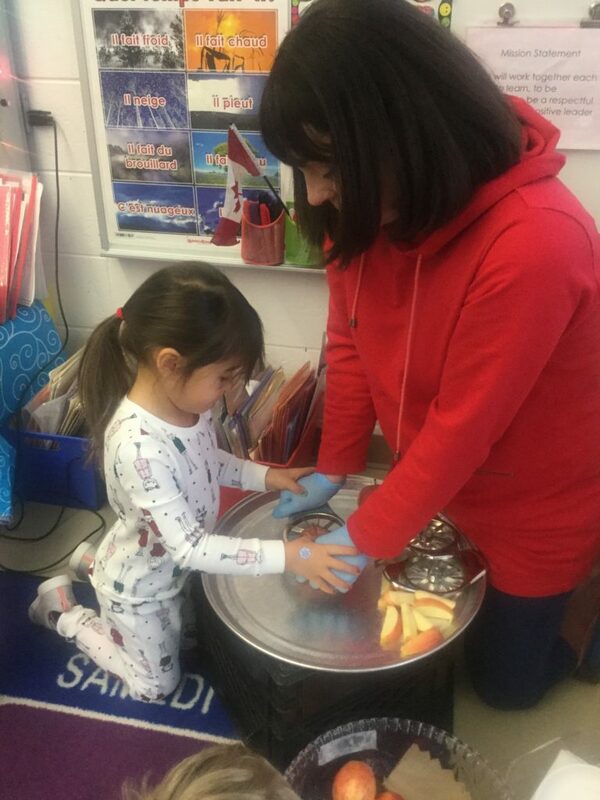 All our students were dressed in their spookiest costumes and served a healthy snack prepared by our Healthy snack committee. Ghost Bananas were on the menu . No sugary treats here! What a fun, healthy and Spooky way to celebrate the day! We love to celebrate our students. 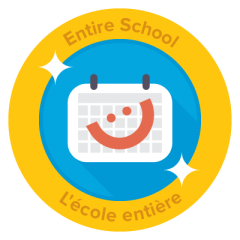 Each month our school gathers to celebrate their achievements. 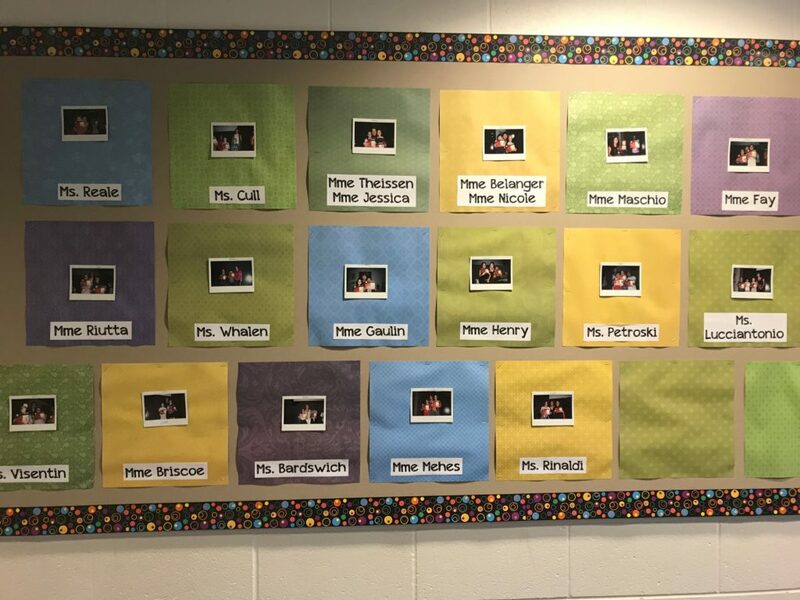 Pictures of these students are then posted on a bulletin board . What a great way to encourage and inspire our Cubs to what to achieve more. 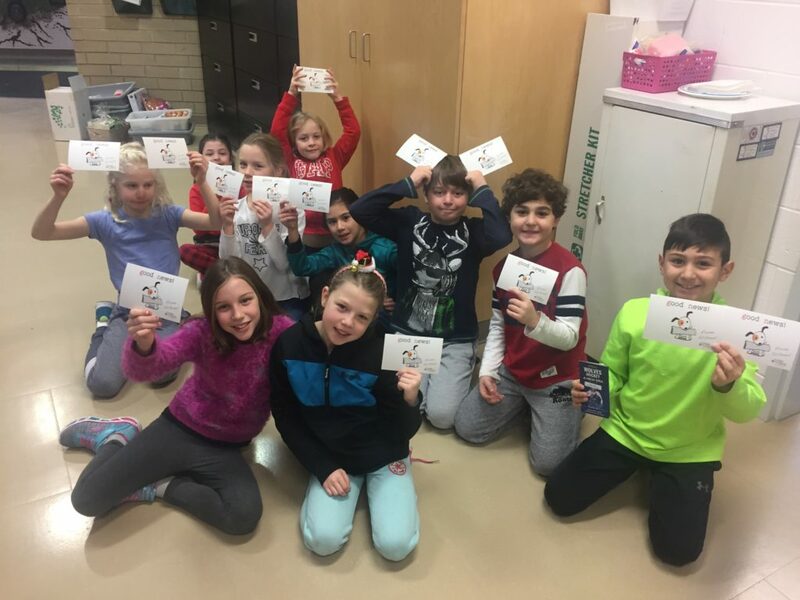 During the month of November our student Healthy Snack Challenge team will take a leadership role in encouraging the entire school to weekly healthy snack challenges. 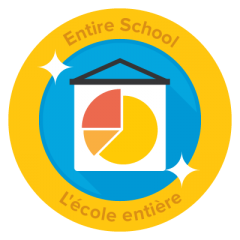 After each challenge we will keep track of our progress and recognize everyone’s efforts Thank you to Mme Henry and her class who have been creating posters and making daily announcements to get the word out! 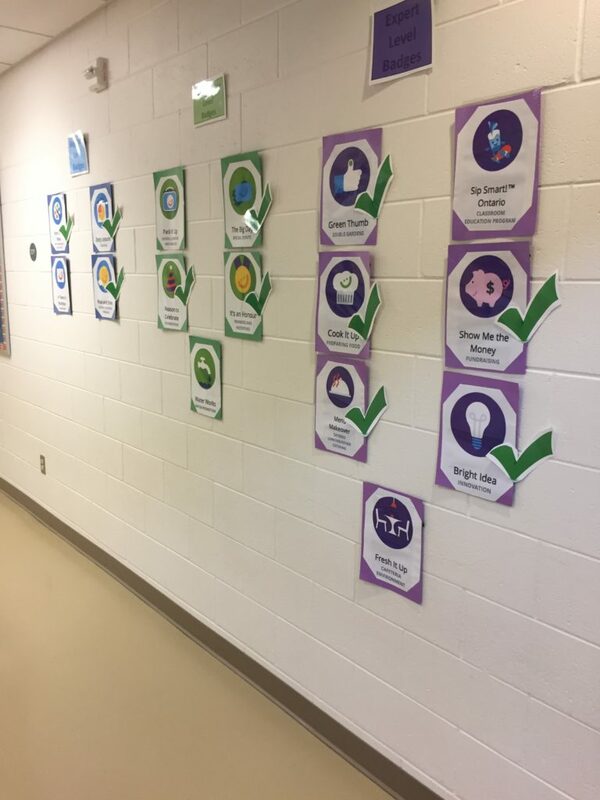 We have also created a bulletin board showing our progress for the Bright Bites Challenge. 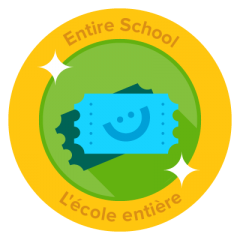 Keep up the great work Cubs! This October a group of teachers and volunteer parents attended an “Adventures In Cooking “ class at the health unit. 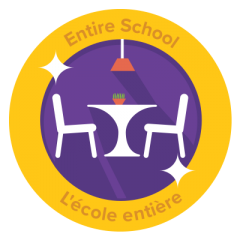 This was in preparation for starting an after school cooking club for students. 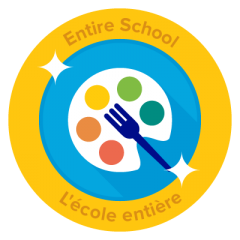 They were instructed on how to teach students about healthy eating, on how to follow recipes, kitchen safety and cooking techniques. Our Cubs are anxiously waiting for this Cooking Club to begin! This week Mme Riutta came up with a great way to engage her cubs in math. 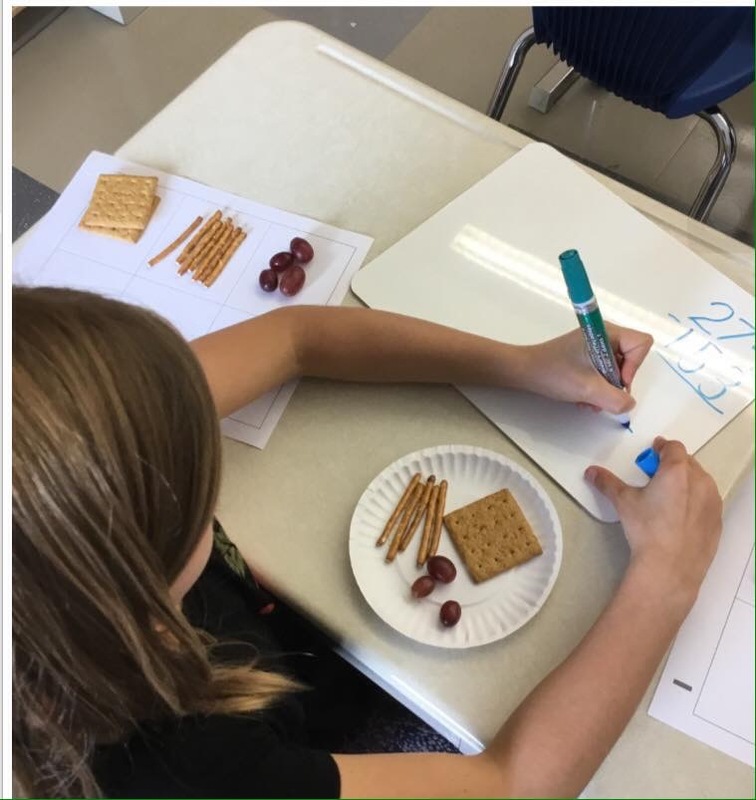 They had a Math Subtraction ” Eat a Thon” using grapes, pretzels and graham crackers. Each food item represented number groups. 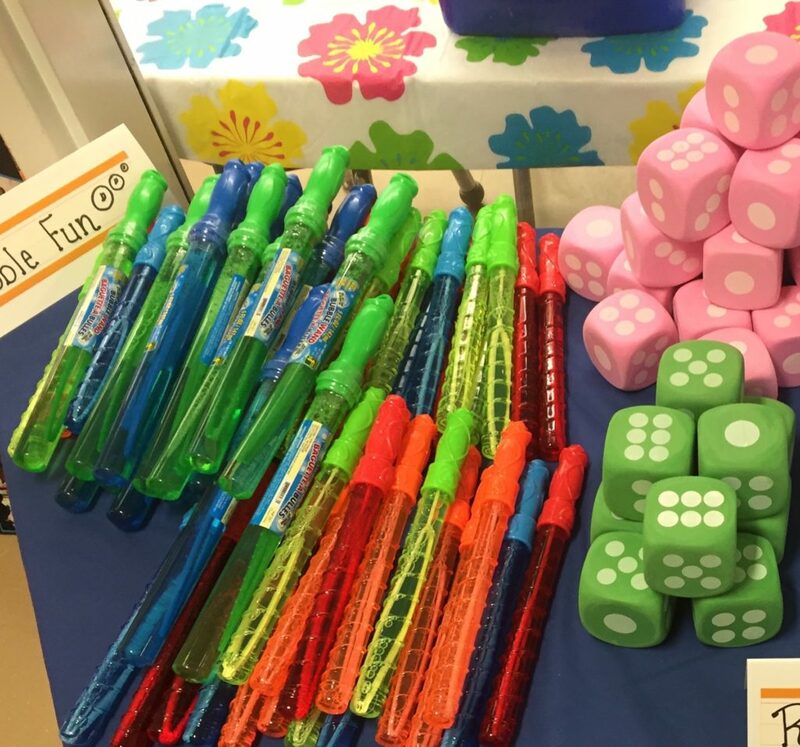 What a great way to get our students learning ! Our Cubs always look forward to grill cheese day. Our Cub Café served delicious grill cheese made with whole wheat bread and cheddar cheese slices . They were grilled to perfection with the help of our parent volunteers . To create an even healthier lunch each grill cheese was served with a side of carrots. During our open house our Snack Committee which includes parents and students made Smoothies . Everyone had a choice of either strawberry banana or blueberry banana. 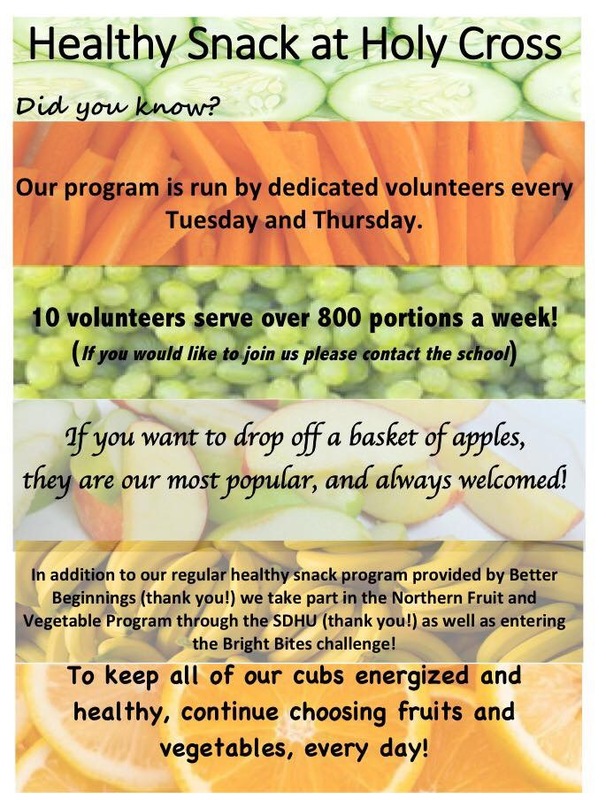 Our Snack Committee continues to challenge and encourage our students and families to add more fruits and vegetable into our busy schedules. Smoothies gives us an easy way to do this. During our next event we plan to try vegetable smoothies! In the spring our students planted flower and vegetable plants in our box garden. They anxiously waited to see their garden grow. Most of the growing happened over the summer , when they arrived back to school this fall, they were surprised to see how much their plants had grown. They harvested the green beans during the first week back . 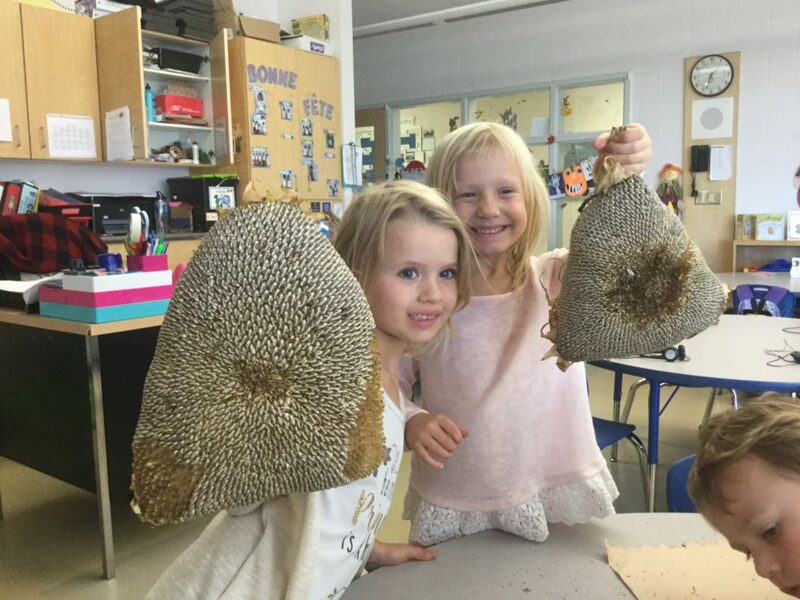 The sunflowers have grown to over 4 feet high and had produced many sunflower seed. The students have enjoyed learning how and what their plants grew. Great things happen at Holy Cross, we have so many reasons to celebrate! 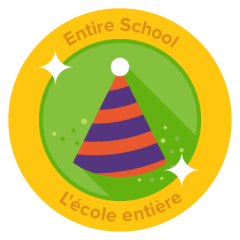 When a student is celebrating their birthday, they receive a birthday ribbon to wear for the day. 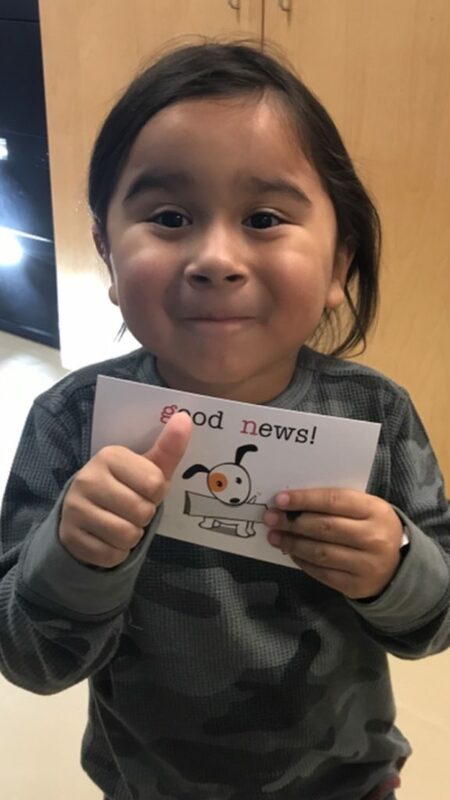 Each week we also celebrate with The Good News Report. 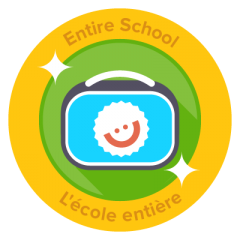 We keep record of all the great things that happen throughout the week that our Cubs achieve, like helping a friend or putting in extra effort to succeed and then we celebrate them . Students that have made it to The Good News Report get to choose a prize. A healthy snack is prepared and served to our Cubs twice a week. 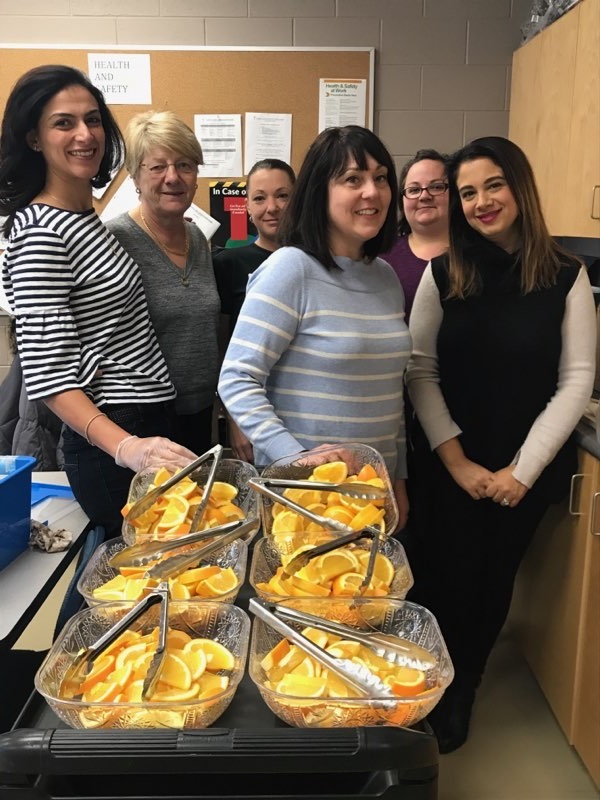 A group of special volunteers including parents and on occasion students help wash, slice and dice fresh fruit and vegetables for our students to enjoy. We also provide fresh apples daily for those students who want an extra healthy snack. We encourage our Cubs to try at least one bite of something that they haven’t tried before. 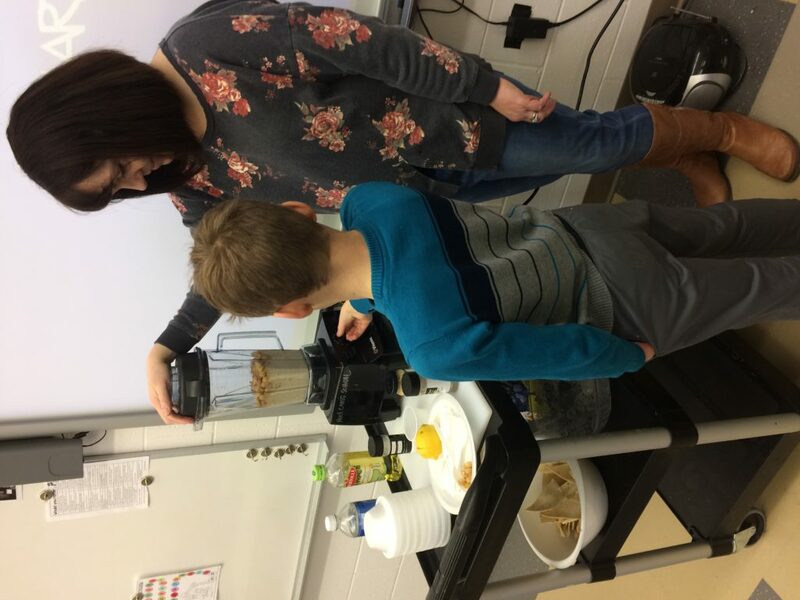 Giving the opportunity to learn about healthy choices for our students is so important! Holy Cross School took part in our 2nd Walkathon Fundraiser. The students collected pledges which earned them a chance to win prizes including a bike and paddle board. 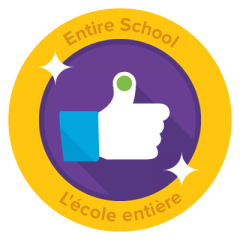 All students ,staff , parents and families walked 2 km through our neighborhood. It was a successful event, we raised enough money for a school playground. The kids had a great time !